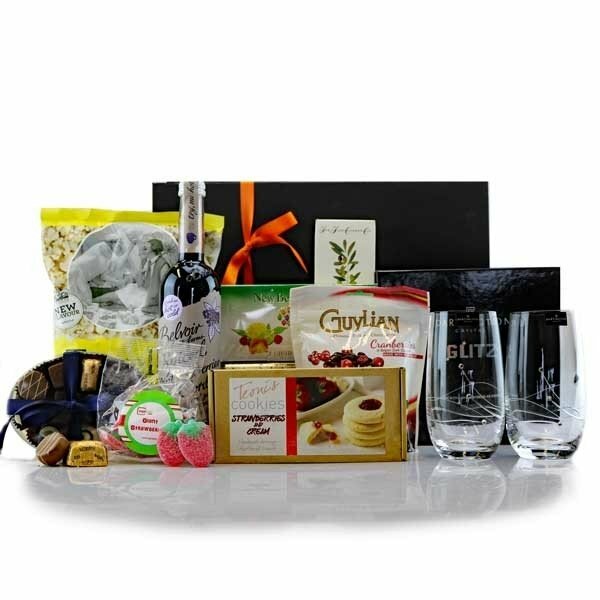 We carefully select the delicious food and drink to go in our hampers, gift baskets and goody bags. Choosing a range of the best artisan producers as well as classic favourites, we ensure we've created a reange of delectable delights to impress, whether you want to reward your staff, thank your clients or treat delegates at your event. Personalised Artisan Cake Squares - £0.99 ex VAT. Introducing our amazing new range of luxury bakes... Second to none, they are a perfect size to treat someone or re-energise with. These delicious cakes can all be branded with your logo or design. Perfect for Events, Team Meetings, Sports Training, Parties, Giveaways, Reward & Recognition; Coffee Shops; Deli's, Food Service, there are no end of reasons why you might want to share these beauties. Whichever one you choose, these incredible cakes are ready to open and serve. Choose from Salted Caramel & Pistachio; Chocolate Chip Brownie; Pecan Brownie; Butter Flapjack, Fruity Granola, Chocolate Tiffin, Rocky Road or why not treat yourself to the lot. All gluten free, these will amaze and delight. No minimum order. Order as many or as little as you'd like! Branded Bag of Sweets - £0.99 ex VAT. Perfect as a delicious and highly cost effective way to communicate your brand message! 6 Luxury Truffle Carton - £1.99 ex VAT. Box of 6 Luxury Milk, Dark & White Truffles - chocolate filled balls, finished in a silver carton with an optional personalised label to finish. 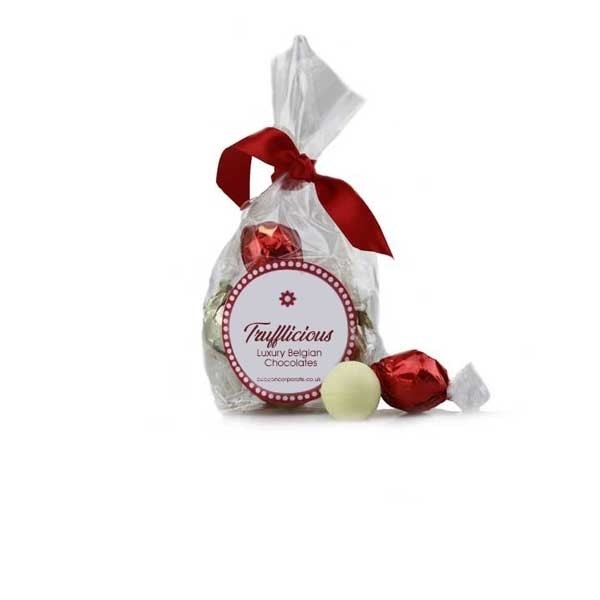 Personalised Truffles - bag of 6 - £1.99 ex VAT. Create your own branded personalised truffles! Create your very own personalised bag of 6 milk, dark & white luxury truffles Finished with your own logo/campaign design &/ or brand message. You can personalise the label with your company logo and message. Simply supply us with a high resolution jpeg of your design or we can help with creating a simple design with you logo and message if you prefer. You're Fab! Sweetie Tin - £2.49 ex VAT. The Sweetest Tin - £2.49 ex VAT. 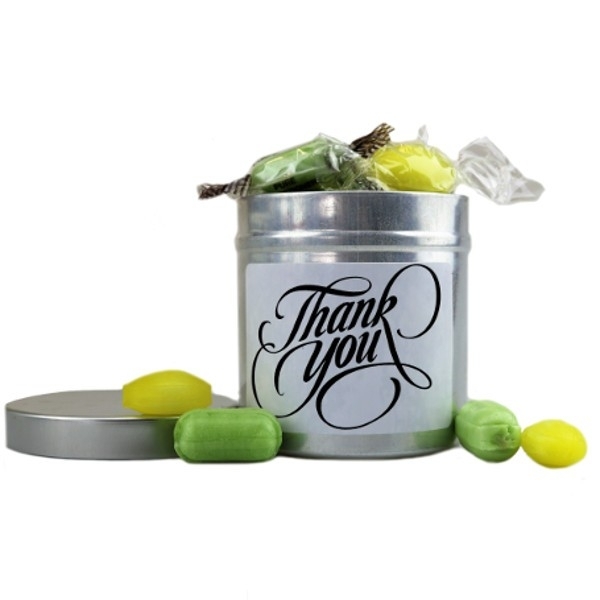 These tins are the perfect keepsake, and the ideal way to thank staff or clients and keep those retention rates high! 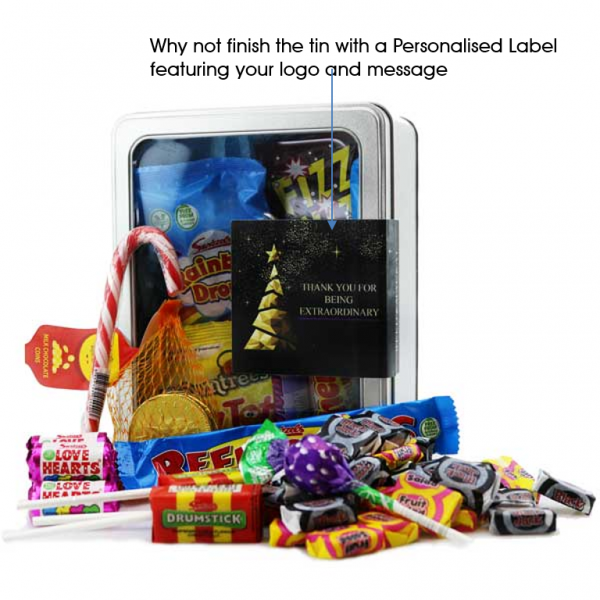 Filled with your choice of sweets or chocolates, and finished with a personalised label. Minimum Cost. Maximum Taste. Maximum Impact. Mini Milk Bottle - £2.99 ex VAT. A quirky way to get your brand noticed! 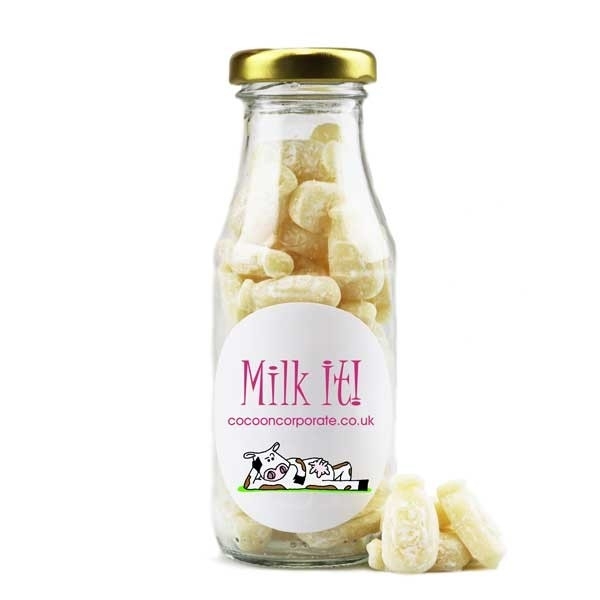 Make sure you milk every moment of brand exposure with this fabulous retro mini milk bottle with a twist off lid, filled with Mini Milk Bottles or a sweetie of your choice. If you don't see your favourite, just ask and we'll make them up just for you! Sweet Jar - £2.99 ex VAT. 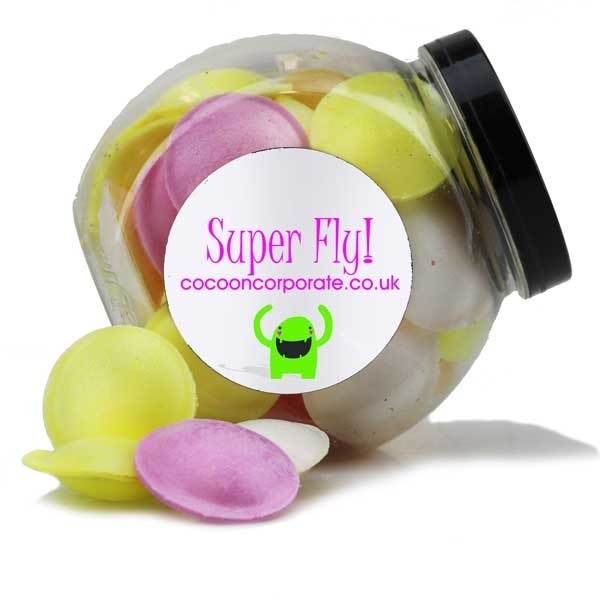 A super fly way to give a little treat! This fabulously retro sweetie jar has a capacity of 500ml with dimensions of 95mm x 78mm x 101mm and is perfect to hold both sweeties and cookies. We've selected a few fillings below, but if you have something in particular in mind, just let us know! It comes complete with one of our own quirky labels or choose to personalise it with either your logo and/or your design/artwork/branding. It's a great way to get people to remember you by and makes a fabulous little keepsake even when the goodies have all gone! Retro Jam Sweetie Jar - £2.99 ex VAT. What could be sweeter than an old fashioned jar of sweeties or chocolates?! It makes the perfect quirky gift! 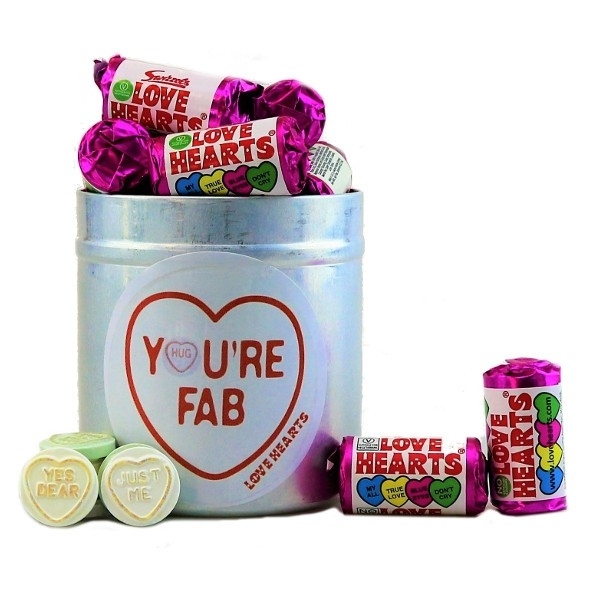 The Retro Jan Sweetie Jar can be filled with your favourite sweets. If you don't see something you fancy from the list below, or would like to co-ordinate with your brand/marketing campaign colours just ask us and we'll create some sweet jars just for you! Comes complete with a personalised label to maximise your brand exposure! 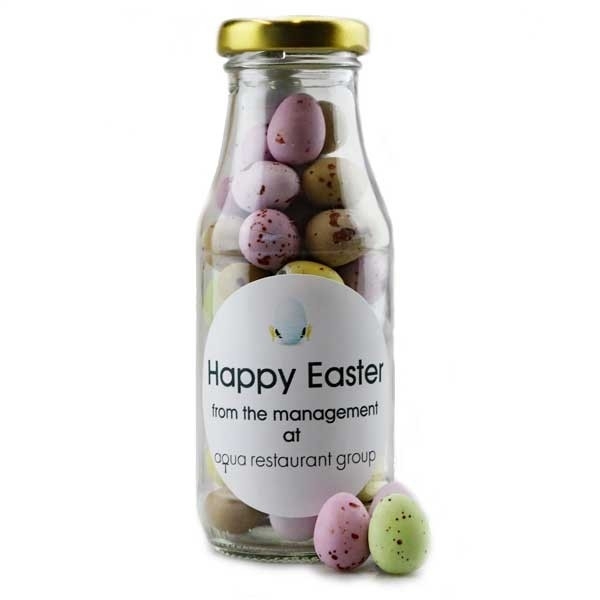 Easter Mini Milk Bottle - £3.99 ex VAT. An Easter treat with a difference! 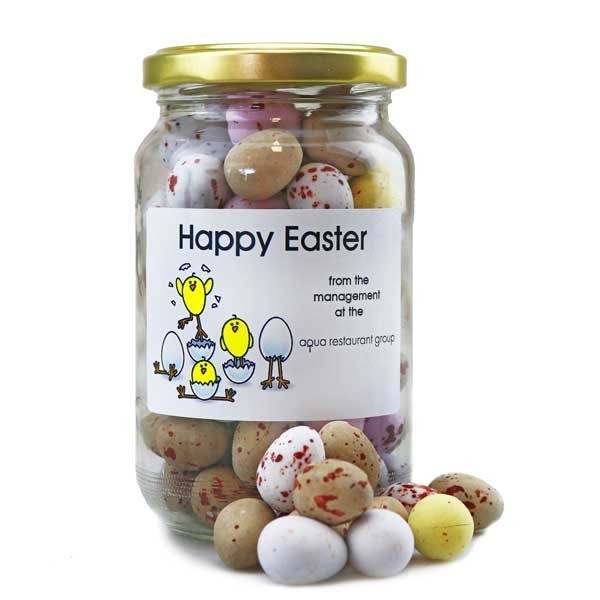 Milk Chocolate Mini Eggs presented in a quirky retro mini milk bottle with a twist off top, finished with a personalised label featuring your brand and/or message/design. Champagne Breakfast - £3.99 ex VAT. 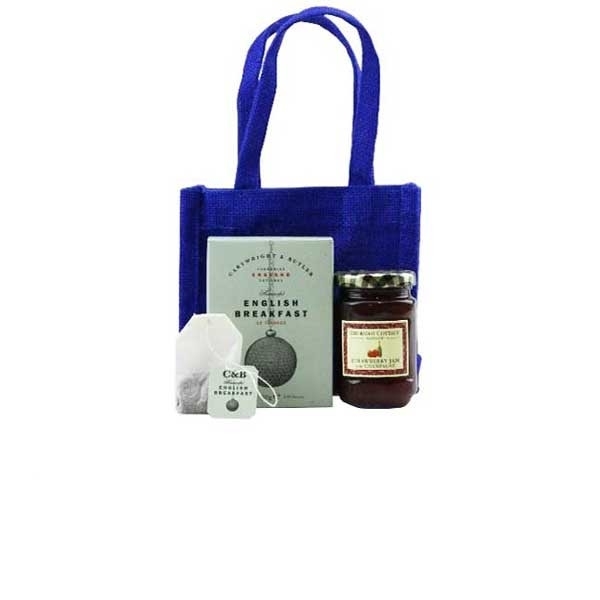 A delightful re-usable jute bag containing quality breakfast items for the start of your day. A perfect little gift for those early mornings! Create your own Goody Bag for £3.99 - £3.99 ex VAT. Pick and choose exactly what you'd like in your goody bags, for just £3.99 each. Simply make your selections and then add to your basket! Remember, if you're looking for something different to what's listed, you can just call us on 01604 780101, email sales@cocooncorporate.co.uk or Brief Us Online and we'll put together something bespoke to fit your budget and requirements. Choose up to 4 items from Group A and 1 from Group B, add personalised gift tags if you'd like, and then pick your goody bag and tissue topper colour. 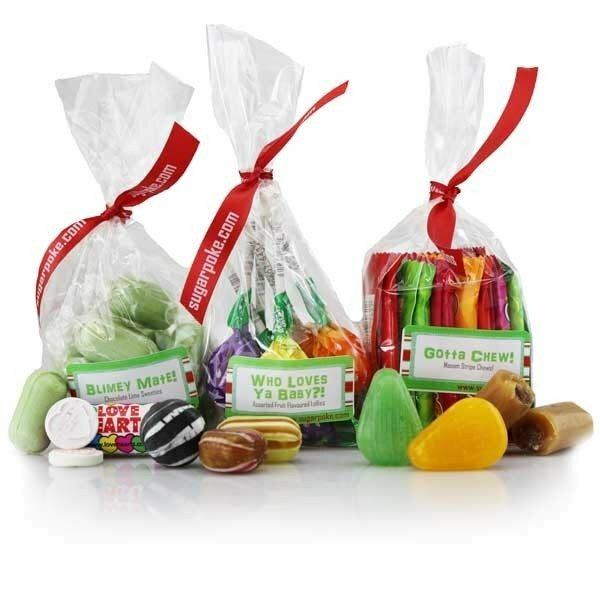 Create your own Goody Bag for £4.99 - £4.99 ex VAT. Pick and choose exactly what you'd like in your goody bags, for just £4.99 each. Simply make your selections and then add to your basket! Choose up to 3 items from Group A, 1 from Group B, and 1 from Group C, add personalised gift tags if you'd like, and then pick your goody bag and tissue topper colour. 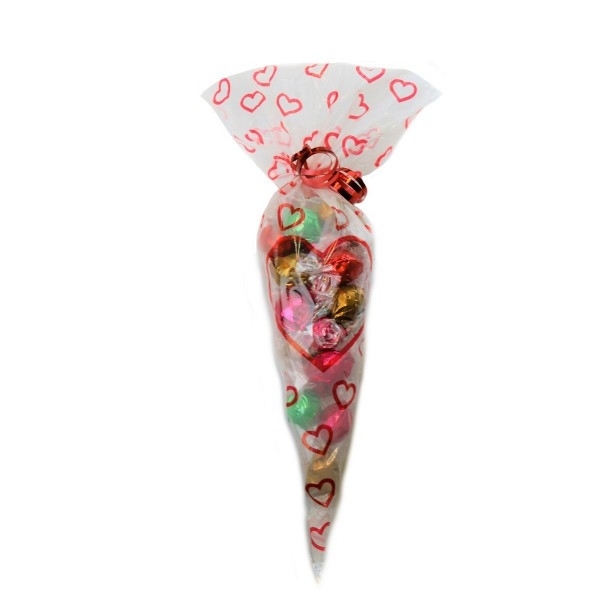 Large Chocolate Truffle Bouquet - £5.49 ex VAT. Our beautifully blooming bouquet is perfect for any chocolate lover this Valentines day! All of our truffles are made with the finest Belgian chocolate and come in a mix of flavours, presented in a large eye catching bouquet shaped bag, which can be finished with a gift tag featuring your own artwork & message to add that personal touch. Measuring 45cm tall this show stopper gives maximum impact without breaking the budget. 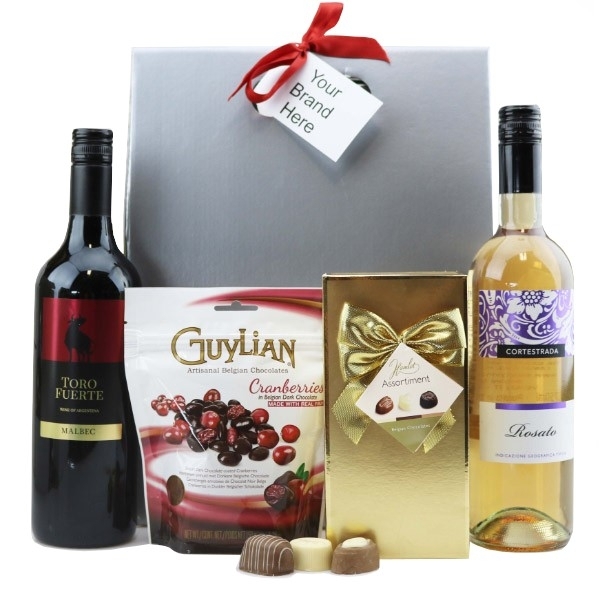 A Little Bag of Wine & Chocs - £5.99 ex VAT. 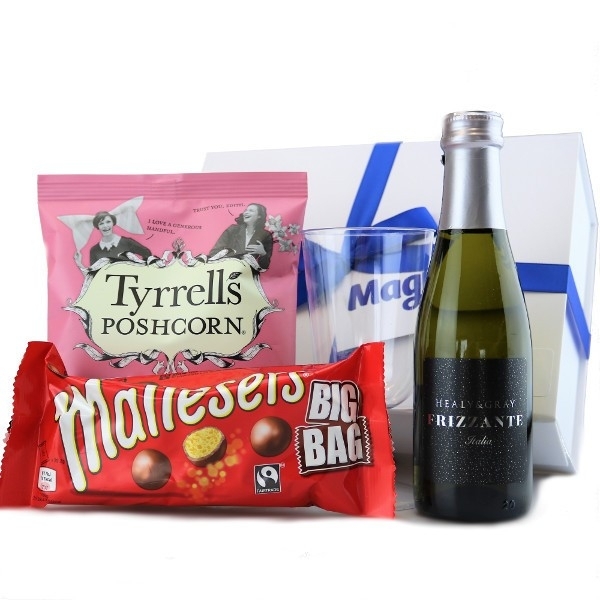 An ideal goodie bag for any occasion, this is one of our best sellers. 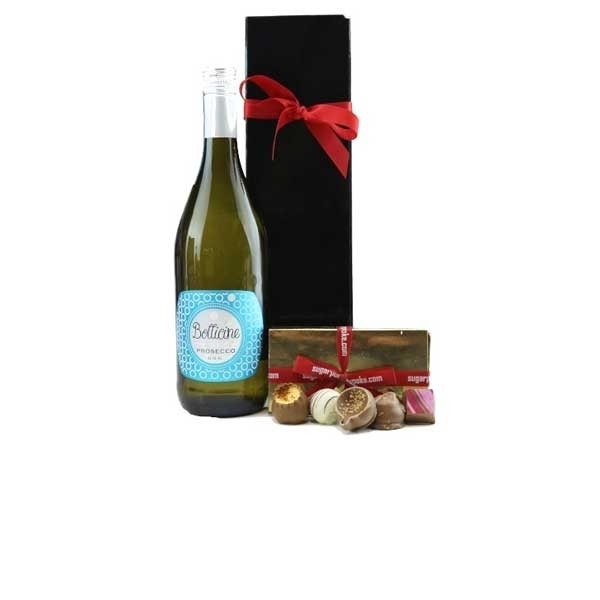 Choose whether you would like red, white or rose wine (or a mixture of all three) and your recipients can enjoy a glass of quality wine along with a cute little box of Chocolates. Tea Break Tin - £5.99 ex VAT. 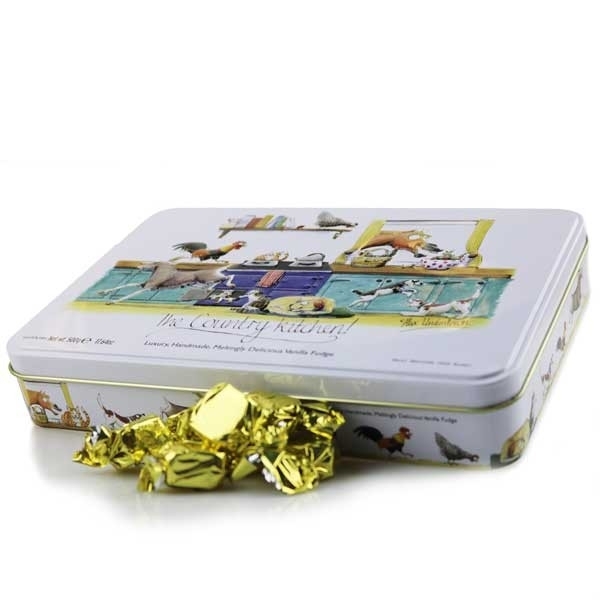 The Tea Break Tin is a cost effective way to give your clients or employees a little treat, whilst giving them something to remember you by. Have the label on the Tea Caddy Tin finished with one of our designs, or with your own artwork/branding and add personalised labels to the mini bite bars to match. Finished with optional ribbon that you can also add a personalised swing tag to if you wish, this is a low cost gift with maximum appeal. Branded Ballotin of Handmade Fudge 200g - £5.99 ex VAT. 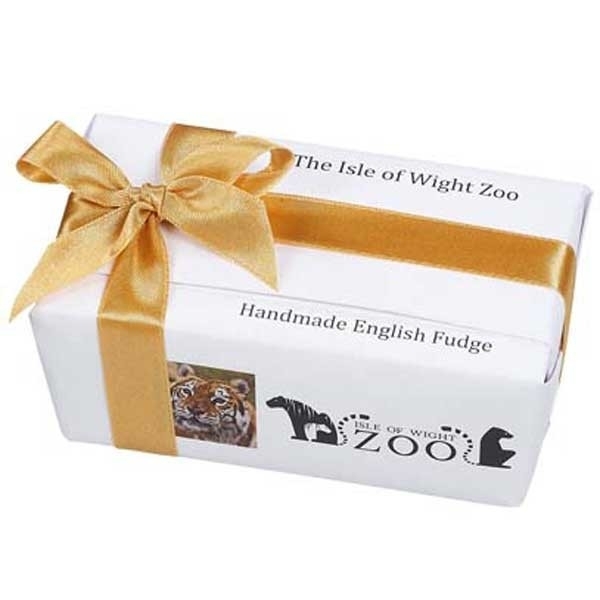 Personalise your own box of handmade clotted cream fudge. The ballotin box is finished with a wrap that can be personalised with your brand images or logo, design and/or text. Finish with ribbon in a colour of your choice to match with your branding. Add a Personalised Tag for that finishing touch to maximise your brand. Please note that we ask for a Minimum Order of 16 boxes for this service. Energise! Goody Bag - £5.99 ex VAT. 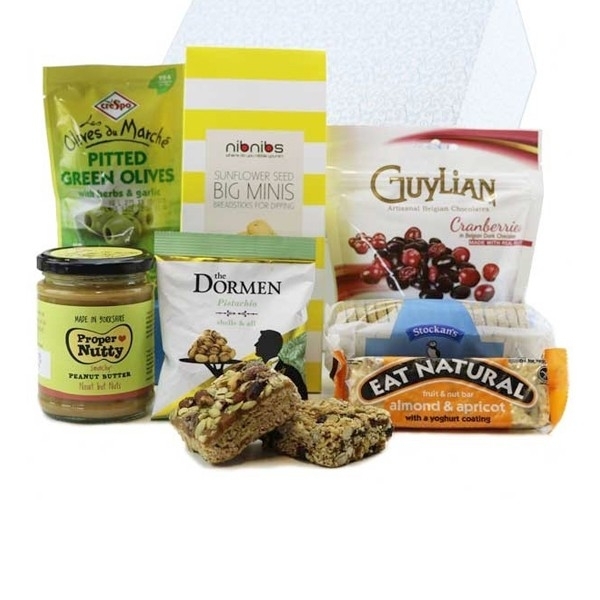 For a refreshing, light and energising goody bag, look no further! 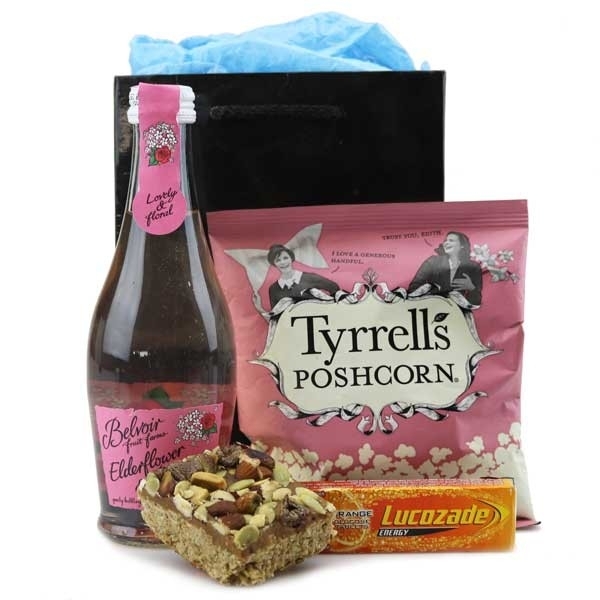 With a light, natural presse from Belvoir Fruit Farms, a sweet and savoury light snack from Tyrrell's, an energising flapjack square and Lucozade Energy Tablets, these contents are bound to put a spring in anyone's step! Perfect for a conference pick me up! In Room Goody Bag - £5.99 ex VAT. 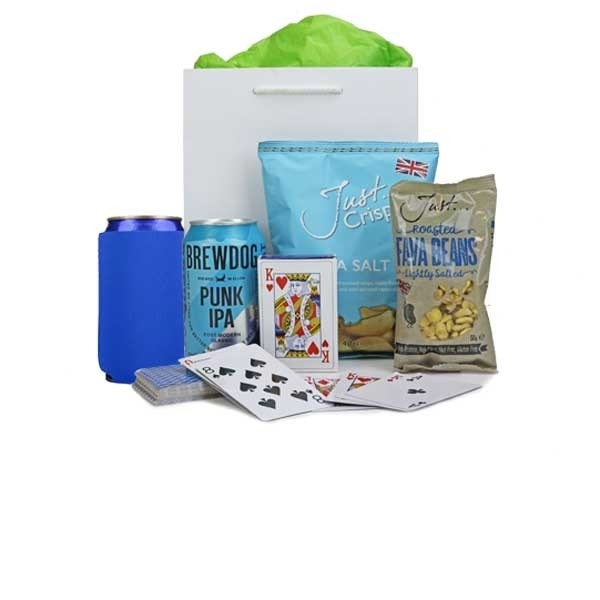 The 'In Room Goody Bag' is a great choice for overnight conferences and events, and is the perfect 'in room' gift. 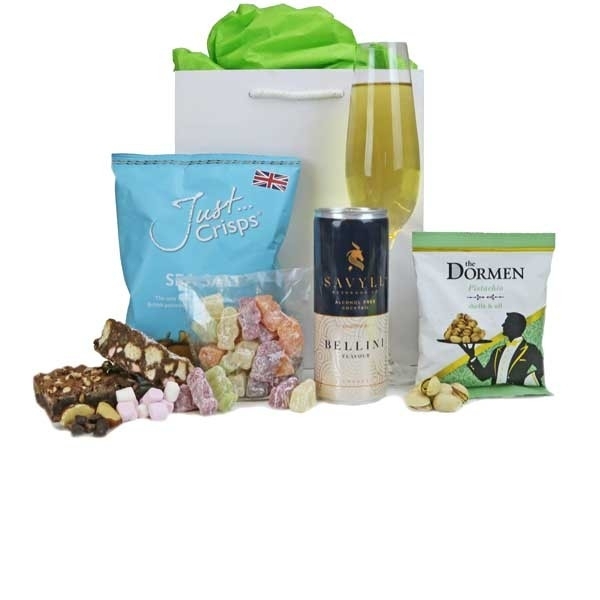 If you want to leave a lasting impression with your colleagues or clients, or just want to leave something delicious to round off a good day or night, this bag of goodies contains a fantastic mix. Whether they have the midnight munchies and want to delve in immediately or prefer to tuck in at a slower pace, these snacks are great at any time of the day. Sparkle - £6.99 ex VAT. When you need a little bag of bubbles and luxury chocolate, look no further. 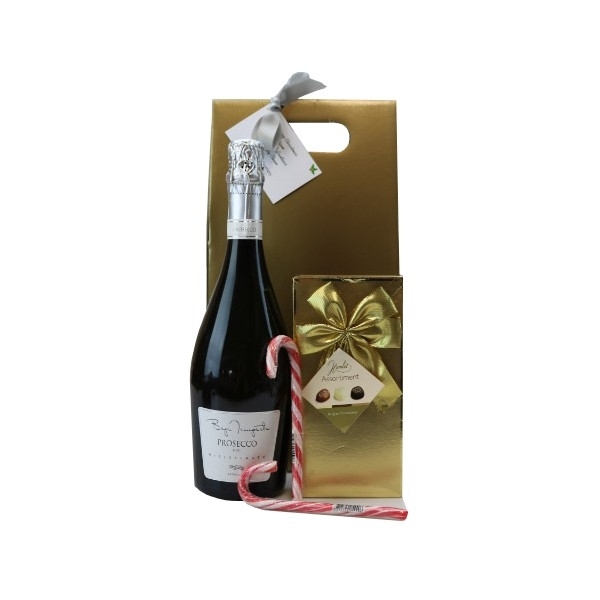 So popular for events and for low cost gifts at Christmas time for both employees and clients alike, this stylish token of appreciation will add a little sparkle to anyone's day. Pzazz - £6.99 ex VAT. A perfect little thank you, this gift has it all. Some bubbles, Belgian chocolates and something savoury. Whether it's conference or party goody bag or an end of year treat, it has all the pzazz that you need! Bit of Bubbly - £6.99 ex VAT. If you'd like a few bubbles to celebrate with, then look no further! 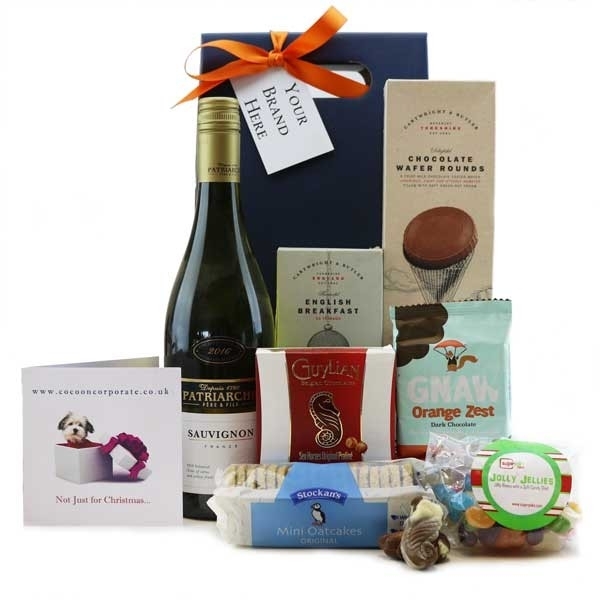 An ideal goodie bag for any occasion, this includes a box of Luxury Chocolate Truffles that can be finished with a fully branded label and ribbon in a colour of your choice. London Pride Bag - £6.99 ex VAT. If you're holding an event, conference, party or just hosting a meeting in or near London, this is the goody bag for you! Disaronno Originale - £6.99 ex VAT. 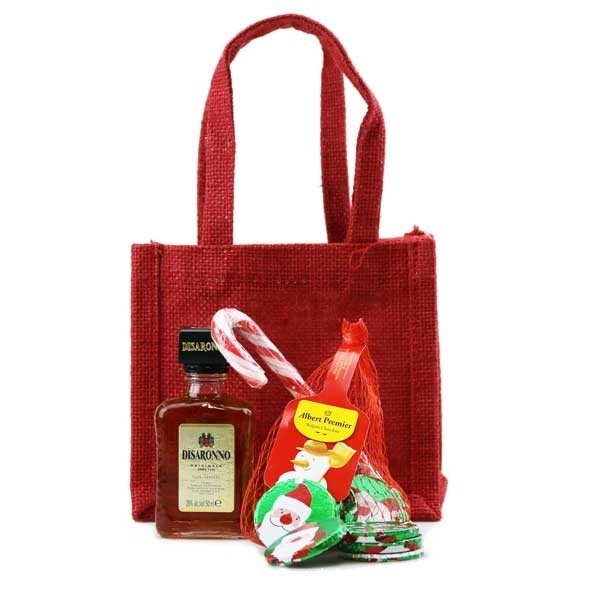 Disaronno, the world's favourite Italian liqueur presented in a reusable jute bag along with a classic accompaniments - a net of Chocolate Coins (available in a classic gold for all year round or a festive design for a Christmas gift) and a Candy Cane. 4 Muffin Box - £6.99 ex VAT. Containing 4 deliciously moist muffins that can go as they are with their own labels, or each be personalised with your own logo &/or design. You can choose from our amazing Double Chocolate Chip Muffins or for a mixed box which will also include the fruity flavours - Lemon & Poppyseed and Blueberry. The mailer also includes one of our own exclusively designed funky greetings cards which you can personalise with your own message. Or, we can design a card specifically for you, using your logo or campaign design or, if you have your own cards or literature we can use those instead. The muffins are presented nestling in tissue paper, in a mailing box ready to give to someone or pop in the post. You can order in bulk to be delivered to one address, or if you'd like us to send them out for you direct to your recipients we can do that too. We will send you a template to complete and then we’ll do the rest! We can send them by Royal Mail (1st or 2nd class if you want to keep costs down) or via courier. Gold! - £7.99 ex VAT. One of our best selling goody bags, and it's not difficult to see why! 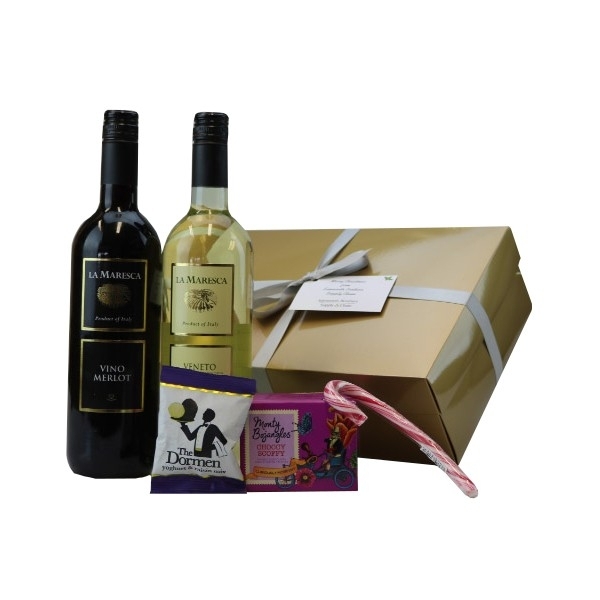 Stylish with a luxury assortment of chocolates and a cute little bottle of wine, this makes an ideal treat for any occasion! 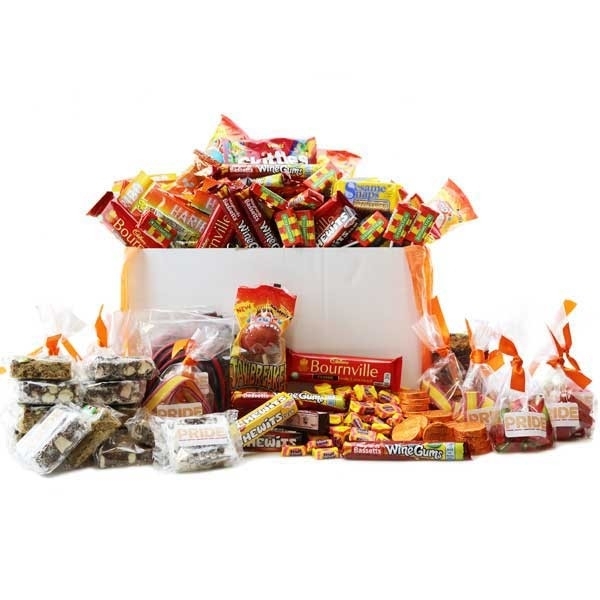 Sweet Treats Hamper - £8.99 ex VAT. 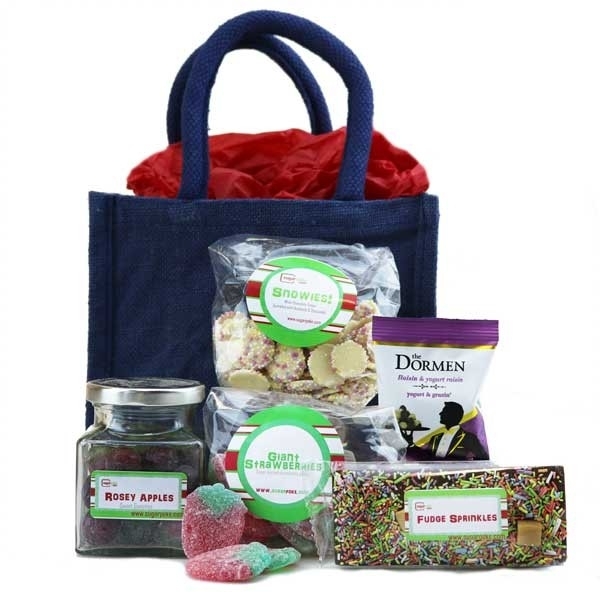 Presented in a lovely little reusable jute bag, a collection of sweet treats that's bound to satisfy the sweetest tooth! Refreshingly Retro Sweet Tin - £8.99 ex VAT. A large keepsake window tin filled with fun retro sweeties that everyone loves! Finish the tin with a personalised label for that personal touch. Add your own artwork, logo and/or message in full colour to create something unique for employees and clients alike. We make our sweet tins to order, so if you'd prefer a different selection or have a budget to meet, just let us know and we'll work with you to create the perfect gift. Wheelie Beer! - £8.99 ex VAT. 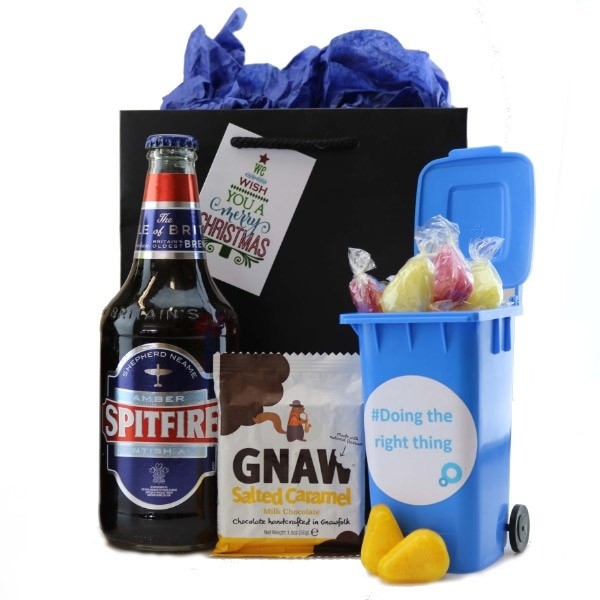 A Novelty Gift including a Desk Top Size Wheelie Bin full of delicious sweets, along with your Favourite British Ale and some Salted Caramel. The Country Kitchen Fudge Tin - £8.99 ex VAT. Handmade to a traditional recipe in the heart of Scotland, Gardiners use only the very finest ingredients to produce their delicious, melt in the mouth fudge. Strawberry Sensation Tin - £8.99 ex VAT. A mini hamper in an aluminium tin with a summer twist! 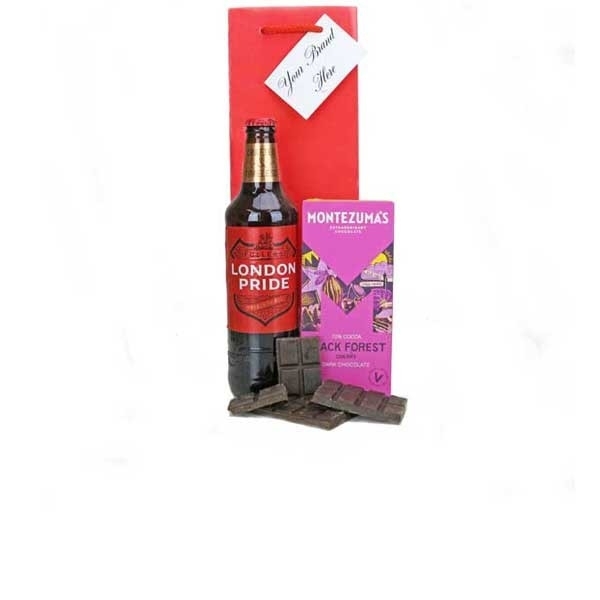 British Beer Box - £8.99 ex VAT. A classic combination. 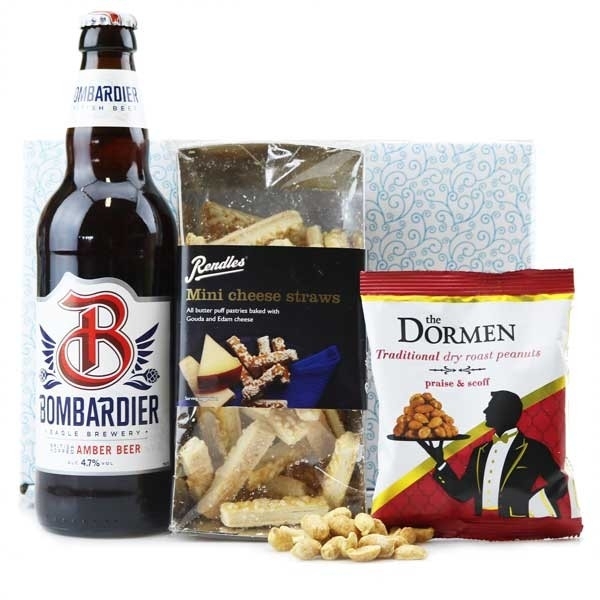 Premium nibbles with a great British beer to wash them down with. 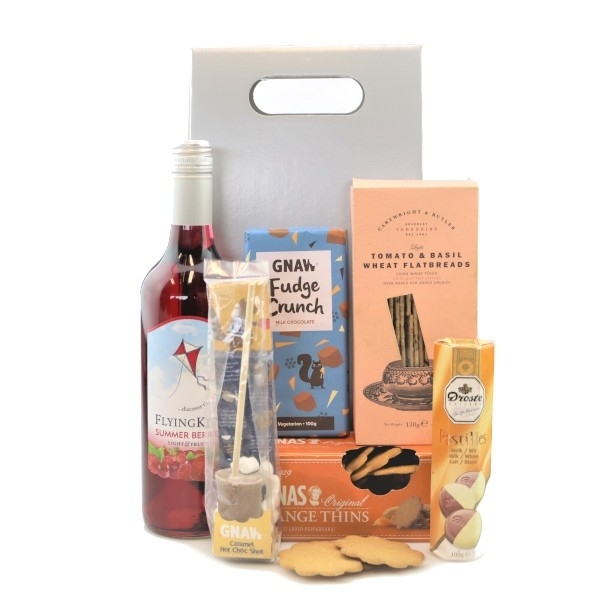 PoshBox Mini Hamper - £8.99 ex VAT. 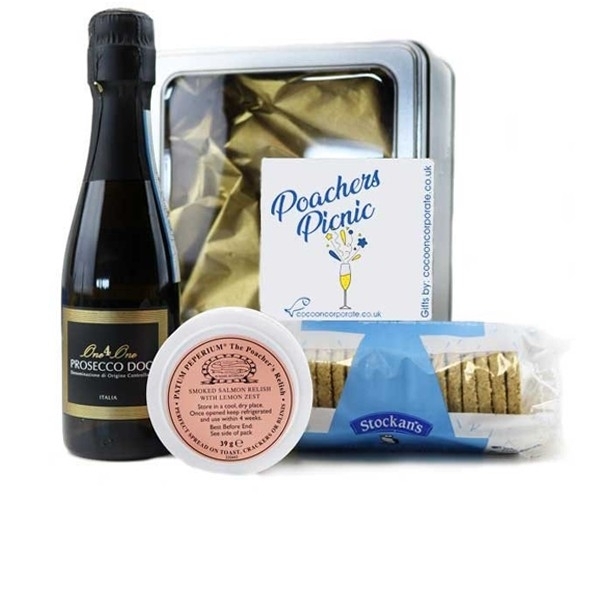 The perfect little treat, Poshbox has everything covered, whether it's an outdoor event, a coach trip, for a cinema screening or even for a trip to the theatre! If you'd like to change the Sparkling Italian Wine for an alternative beverage, please don't hesitate to ask. A Little Something - £9.99 ex VAT. Whether you need 'a little something' to say thank you to employees or clients, or it's for delegates to take away with them at the end of an event, this makes a memorable treat! Stylish and simple, we can also match your branding or event theme with the chocolate box colours, ribbon and finish both the box and gift bag with a tag featuring your artwork or logo. With the chocolate box, choose from our fabulous selection of luxury chocolates. Choose to a dessert theme and enjoy some 'devilish desserts' or choose your own favourites, it's easy to amend your selection to suit. Of course, if there's a particular theme that you're looking for, don't hesitate to ask, we can source just for you. 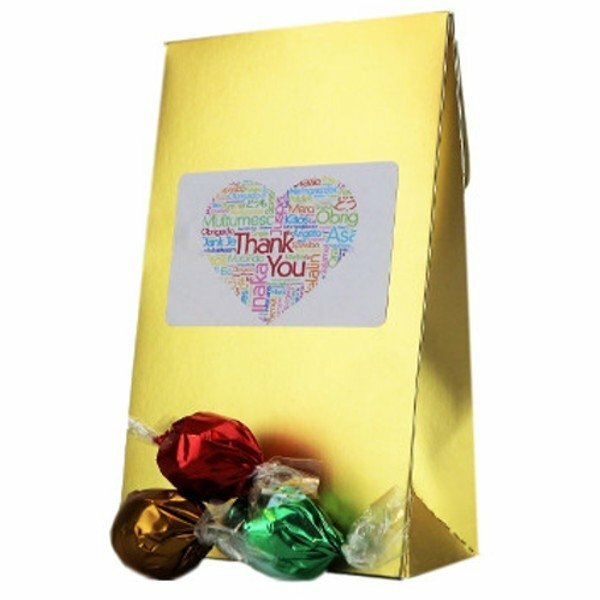 One of our best selling goody bags, it's a little something that will make sure that they remember you. Essentials - £9.99 ex VAT. 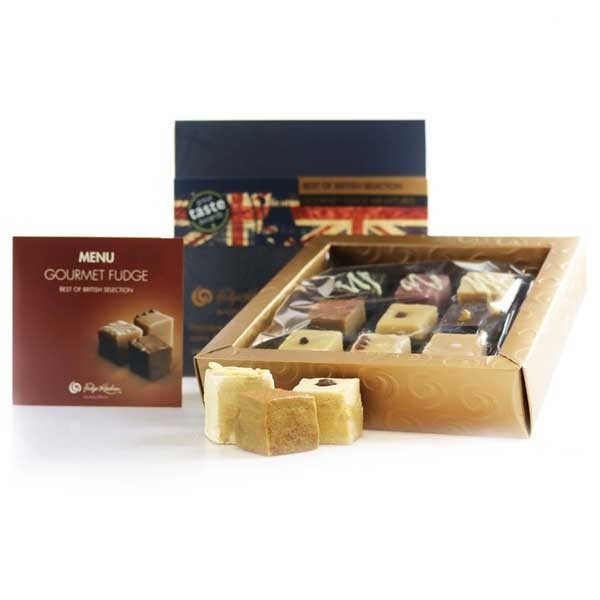 Best of British Gourmet Fudge Miniatures - £9.99 ex VAT. Fudge Kitchen have been hand-crafting their amazing fudge for over 35 years, and use traditional methods to create some fabulous products and flavours. Devilishly different, it’s made with fresh whipping cream which not only makes it smooth, soft and creamy but of course, absolutely delicious. Made with natural ingredients, it contains no preservatives, it's vegetarian friendly and gluten free. Personalised Keepsake Hamper Tin - £10.99 ex VAT. Brand this fabulous keepsake tin with your message, logo or artwork for a fantastic hamper that's bound to wow! It comes complete with one of our label designs or you can choose to have your own artwork/logo/message to finish the tin in your style. These keepsake tins are a great choice if you want to give something that's just that little bit more memorable. Filled with superb products, it's also easy to give or send, contains no alcohol and can be adapted to give at any time of year. If you'd rather have different contents to the ones below, please just let us know. Bag of Beer - £10.99 ex VAT. One for the men and all those ladies that love a beer! Starlight Sensations - £10.99 ex VAT. An ideal goodie bag for any occasion, this would make a great gift at any time of year. It would also make a stunning finish for the table if they are to be given out at an event or conference. Celebration Tin - £10.99 ex VAT. A cute aluminium tin that can be personalised, filled with delicious goodies to help celebrate! Tea Time Tin – Vegan - £10.99 ex VAT. 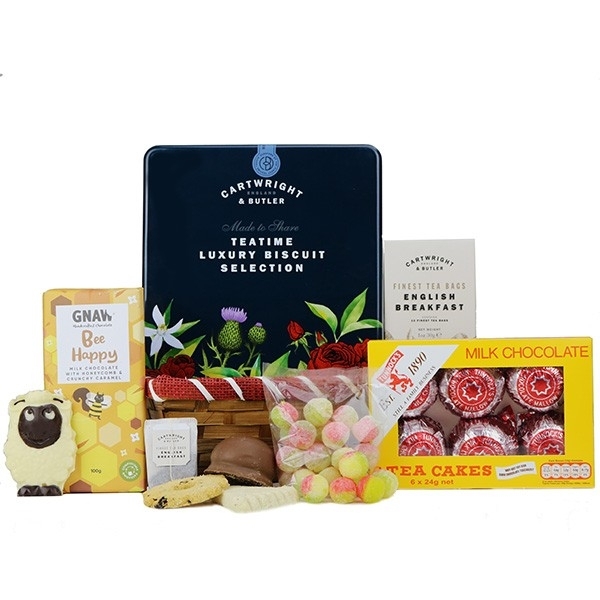 A great choice for Vegans, this fabulous Tea Time Tin is filled with premium products that won't disappoint. The tin itself can also be finished with a personalised label featuring your message, logo and/or artwork. A great way to maximise your brand and message without breaking the bank. We offer a whole range of dairy free, gluten free and vegan products, so if the one below isn't to your taste, just let us know and we can change the contents to suit. Tea Time Tin - £10.99 ex VAT. 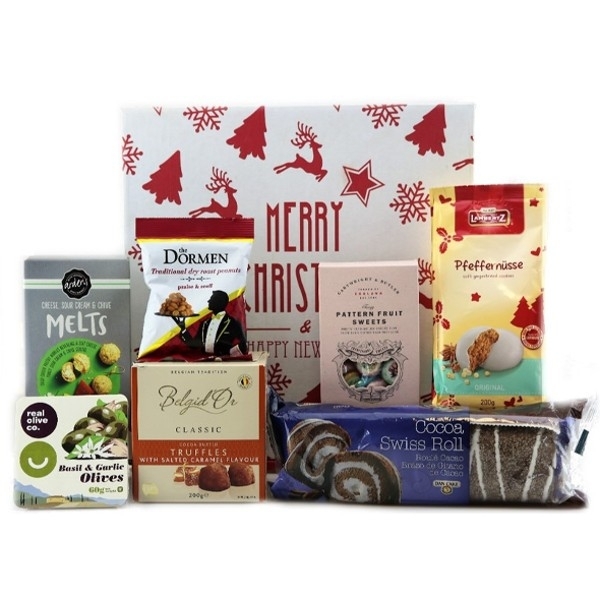 A great value hamper that's great for anytime of year. Brand with your own artwork, or choose one of our stock label designs to finish off the keepsake tin. Hero! - £10.99 ex VAT. A great welcome into a team, this goody bag says it all! 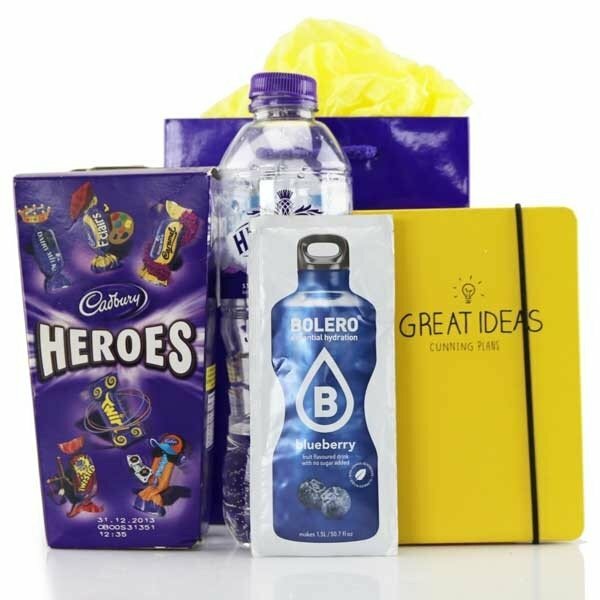 Keep them hydrated and topped up with chocolates for all their great ideas and they'll be your hero in no time. Equally great for reward and recognition or for conferences and events. 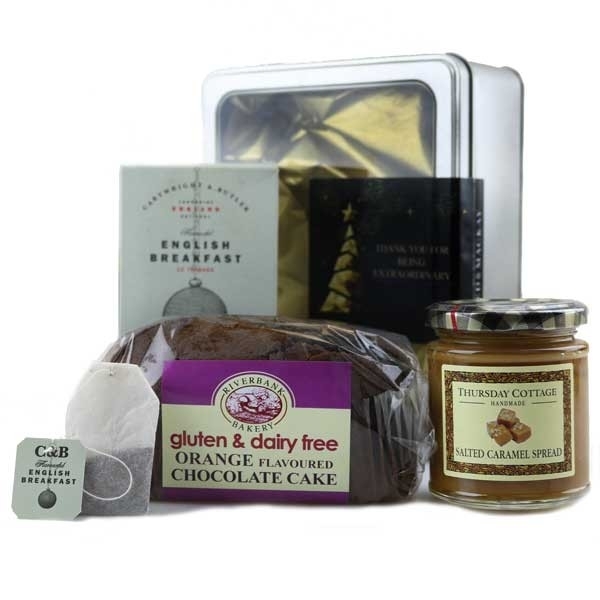 Tea Time Tin – Gluten Free - £11.99 ex VAT. Who doesn't love to put their feet up with a good old cuppa and a delicious selection of finest treats? 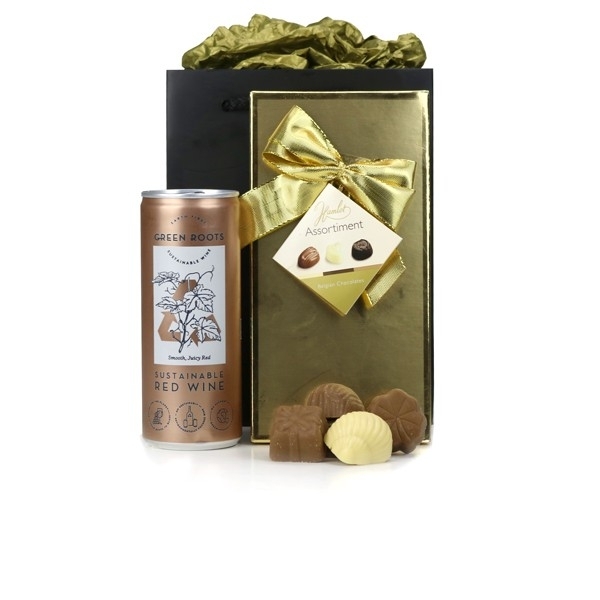 A great choice if you want to give something that doesn't contain alcohol, this superb tin makes a great present. It's filled with premium products and the tin can also be finished with a personalised label with your message, logo and/or artwork. A great way to maximise your brand and message without breaking the bank. We offer a whole range of dairy free, gluten free and vegan cakes, so if the one below isn't to your taste, just let us know and we can change it for a different one. Shiraz & Savour - £11.99 ex VAT. 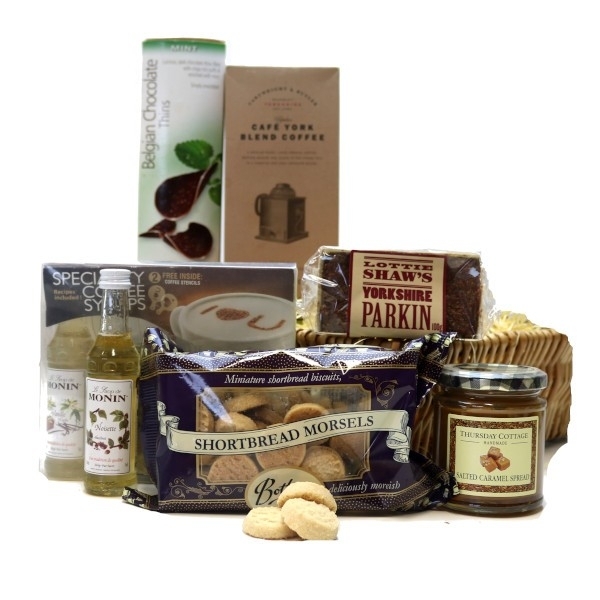 Ready to order for next day delivery, this is a perfect mini hamper for any time of year! With a premium red wine, chocolate and nuts it won't disappoint. Own Label Branded Wine - £11.99 ex VAT. This well balanced, rich, fruity, premium Malbec wine is available to personalise with your own brand, message or artwork with a full colour front label. Perfect to celebrate anniversaries, birthdays, to say thank you or to welcome people to a new job or home. Please just ask us if you would prefer a different wine varietal. 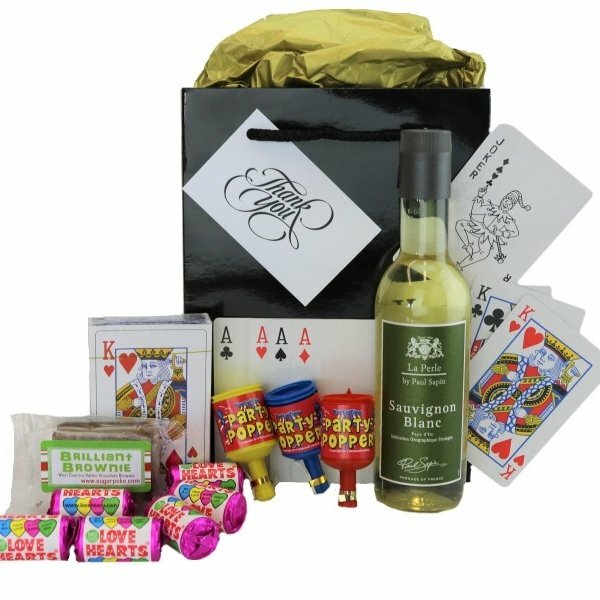 London Fun Goody Bag - £11.99 ex VAT. If you've got visitors coming from overseas, or you're holding a conference/event in London, look no further than this goody bag to complete their experience! 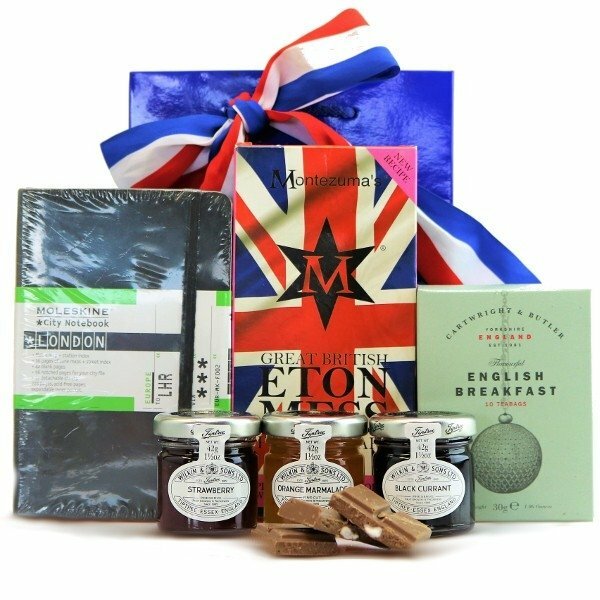 With the contents including shortbread and tea from the wonderful Cartwright and Butler brand, chocolate from the quirky but very British Montezumas, you can't fail to impress. Perfect Pairings - £12.49 ex VAT. It's the softness and the subtle plum flavor that makes this Merlot the perfect pairing for chocolate, Merlot especially goes well with the equally soft interior of these luxury Cocoa Dusted Truffles, but be warned, they are curiously moreish! Choose one of the Belvoir Without the Hangover choices for an alcohol free option! Nibbles & Dips - £12.99 ex VAT. With light Italian mini bruschette, delicious smoked salmon pate and a classic salsa dip this makes a terrific pick me up hamper for anytime of year. Whether it's a summer away day, a conference, team meeting or for a Christmas gift, this is the real deal with classic products that make a perfect treat. Poachers Picnic Tin - £12.99 ex VAT. 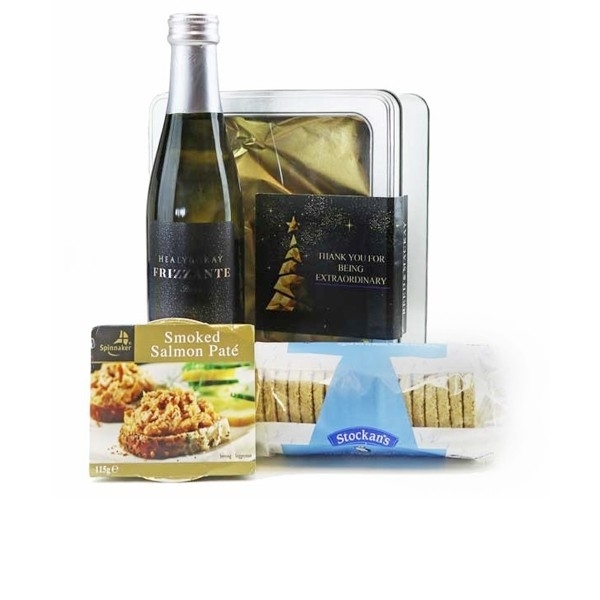 For the more discerning, this wonderful keepsake tin includes a delicious smoked salmon relish with a lemon zest that's perfect to spread on the crackers that it comes with. Alongside a little bottle of Prosecco, this terrific trio is great for something for the summer-time as well as a great Christmas gift. Smoked Salmon Sparkle - £12.99 ex VAT. You can't beat smoked salmon and Italian sparkling wine, so we've teamed up this little beauty in a great keepsake tin that can be personalised if you'd like it to be. It comes standard with the contents as shown, or you can add olives, pistachios or even mints if you'd like. Of course, if there's a different combination that you'd prefer, then just let us know and we'll put something together just for you! The tin comes complete with one of our own label designs or you can choose to have your own artwork/logo/message to finish the tin in your style or to match your branding. 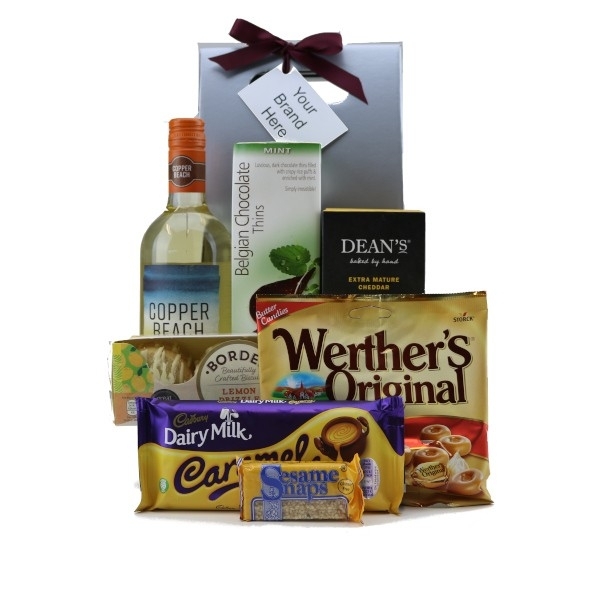 Sweet n Savoury Hamper - £14.99 ex VAT. No alcohol? No problem! We have a festive selection of sweet and savory treats perfectly presented in a marvelous Merry Christmas hamper box just for you. Marvellous Morsels - £14.99 ex VAT. This marvellous mixture of tasty treats includes some real corkers! From the wonderful Monty Bojangles with the box of Choccy Scoffy, divinely chocolatey cocoa dusted truffles; to the fabulous handcrafted chocolate bar from our friends at Gnaw it's a real favourite. Along with shortbread, flatbread and salted caramel fudge, sweeties and tea it's also great value and is bound to impress! Smart Sparkle - £14.99 ex VAT. 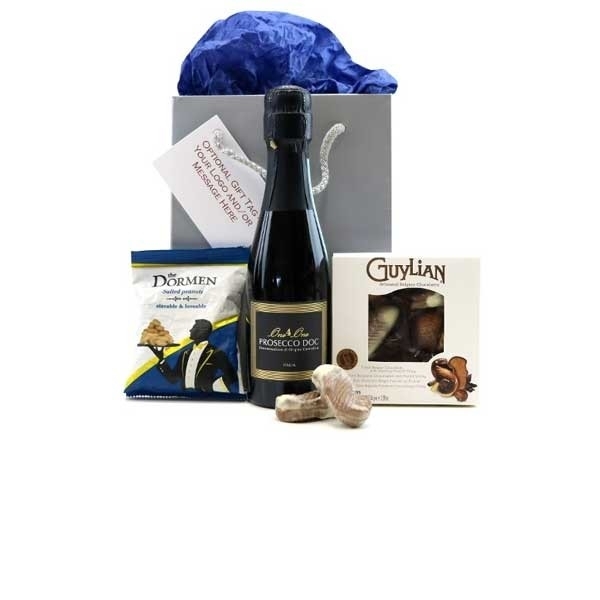 Keeping it simple with a smart bottle of superb Italian sparkling wine, a lovely box of chocolates and some nibbles. Add your own finishing touches for that extra sparkle! 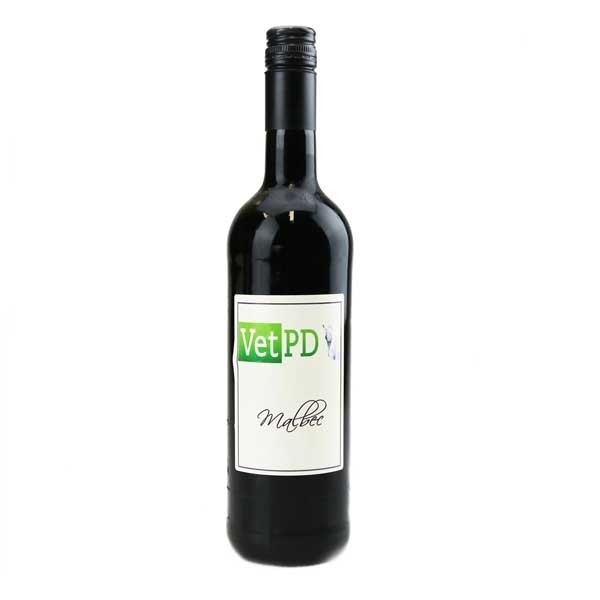 The Pinot Pick-Me-Up - £15.99 ex VAT. 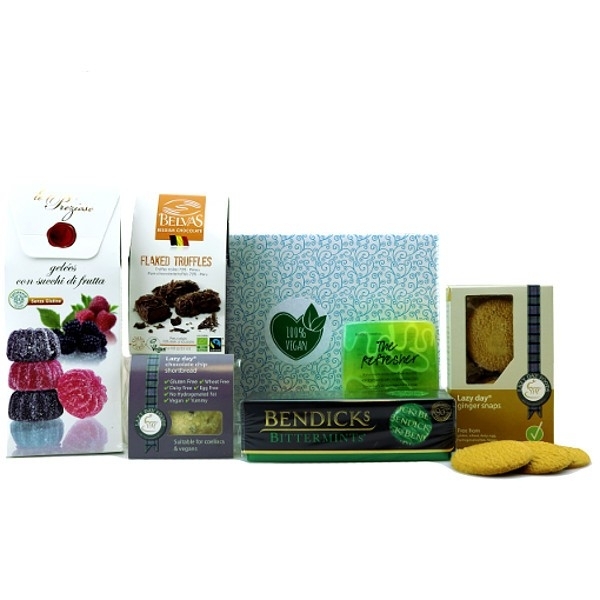 Ready to order for next day delivery, this brilliant bundle of treats is exceptional value. With a full bottle of Pinot Grigio, chocolates, cheese wafers and biscuits, it's bound to please. With Thanks - £15.99 ex VAT. 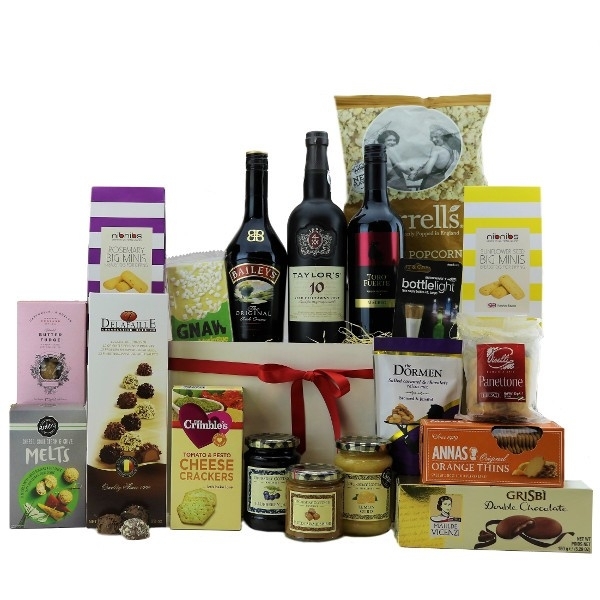 Ready to order for next day delivery, this fabulous hamper is brilliant when you just need to say thanks for a job well done, for a colleague's support or going that extra mile. You can't beat a little instant reward and recognition, and this will do that in style. 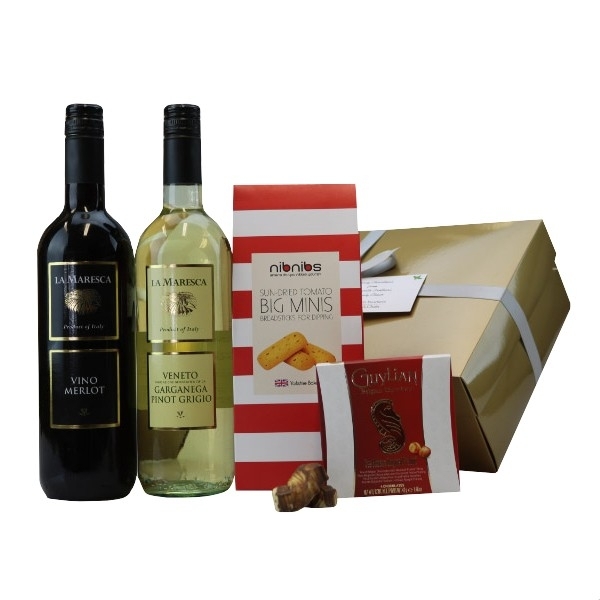 Filled with a variety of chocolates, sweets, biscuits, savoury snacks and a red bottle of wine it's great value too. 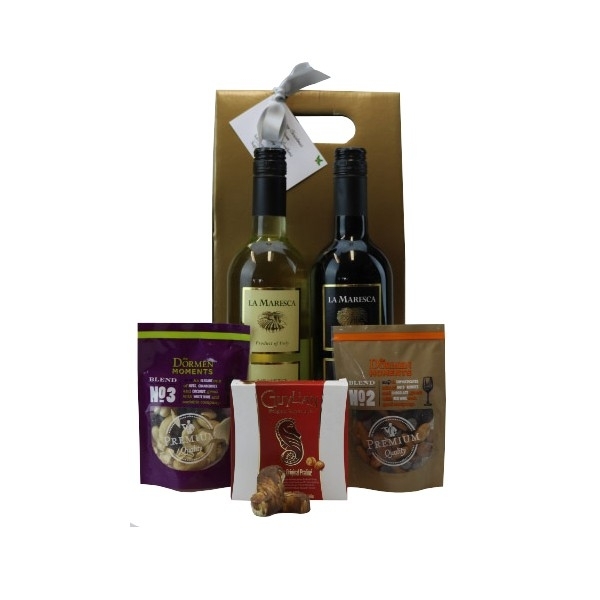 A Little Thank You Hamper - £16.99 ex VAT. 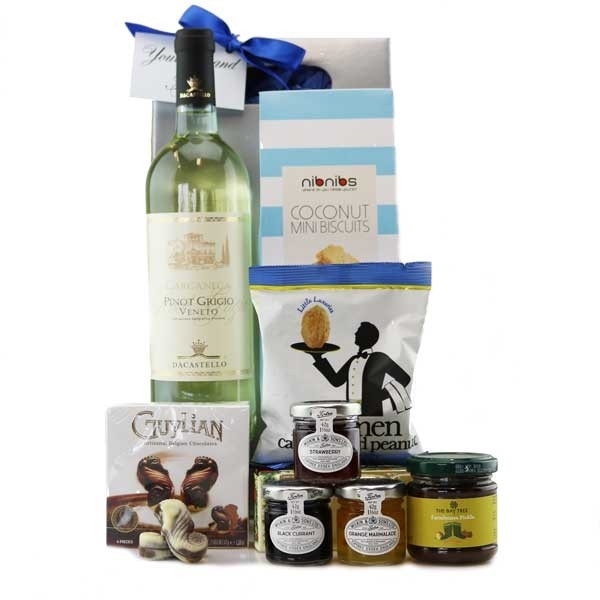 Say 'thank you' with this gorgeous selection of treats along with a full sized bottle of wine! 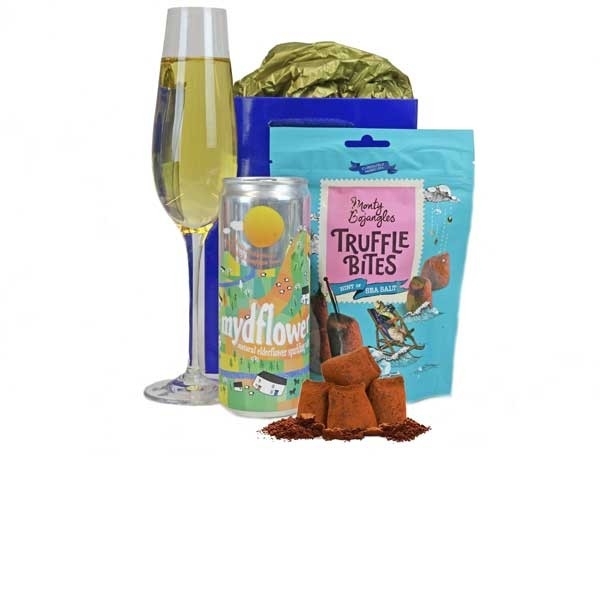 Chocolate & Prosecco - £16.99 ex VAT. Great for an all year round gift! Whether it's to thank your team for a great job well done, a milestone that's been achieved, or to send to clients to thank them for support during the year this will do the job nicely! 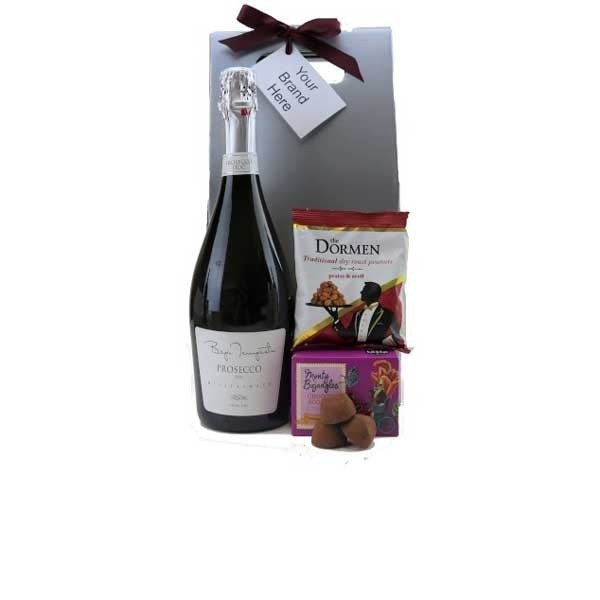 Prosecco and Chocolate Delight - £16.99 ex VAT. A quality gold gift carton containing Prosecco and a Box of Chocolates along with 2 Candy Canes. The perfect indulgent gift for him or her! Cakes & Sweet Basket - £17.99 ex VAT. 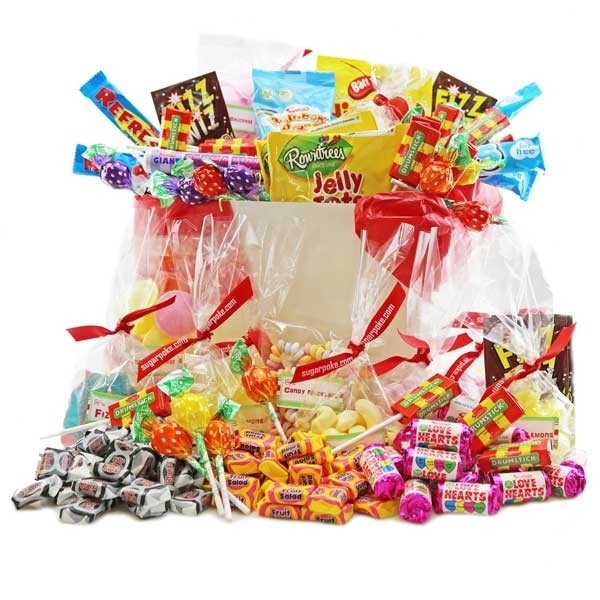 Packed full of sweet treats, the fantastic Cakes & Sweets Basket makes a great choice for both individuals and groups of people to share at home or in the office! Irresistibubble - £17.99 ex VAT. 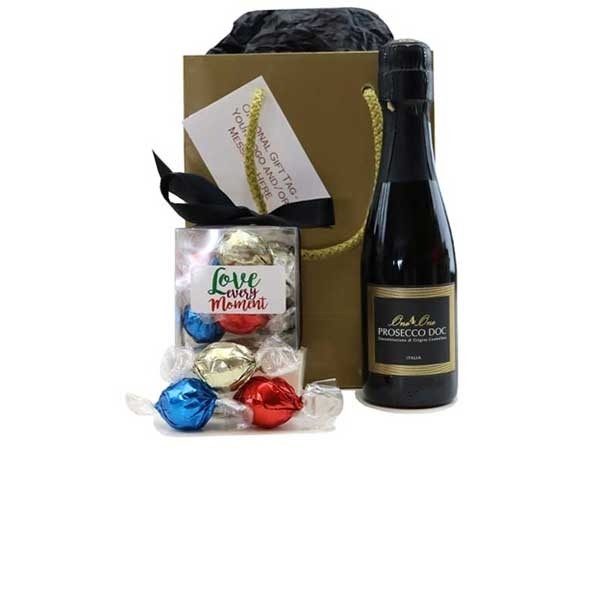 Irresistible gifts with a bit of bubbly, premium chocolate and nuts! Panache - £17.99 ex VAT. 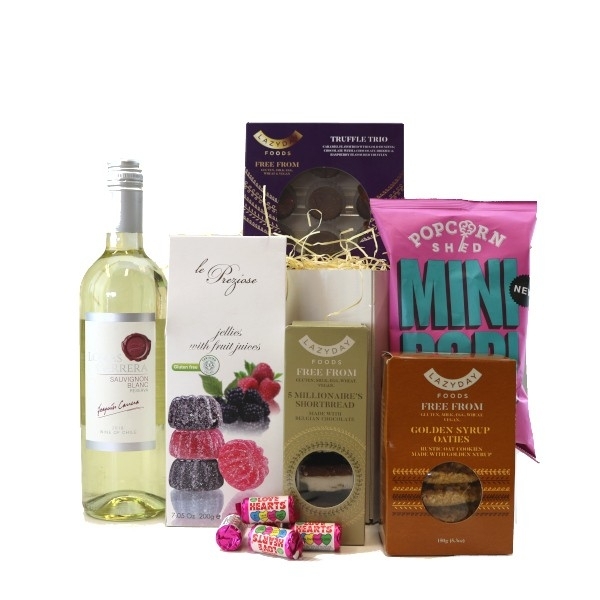 With a lovely bottle of Prosecco, this gorgeous collection of wine, chocolate and nibbles will suit all. Dazzle - £17.99 ex VAT. 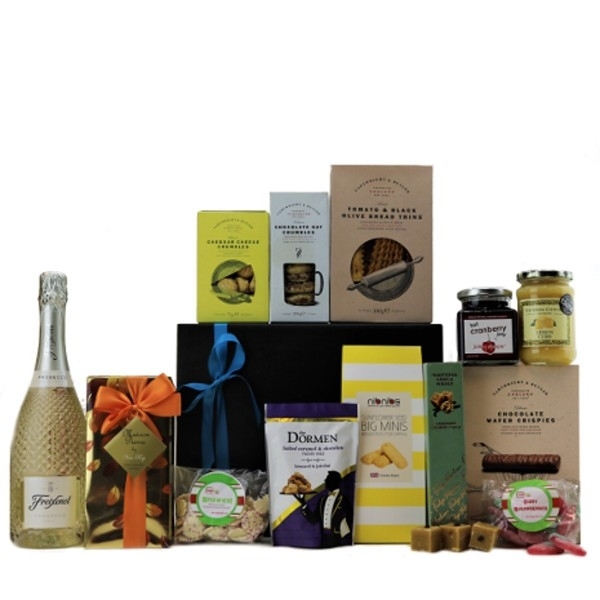 A real delight, this luxurious hamper is dressed to impress. 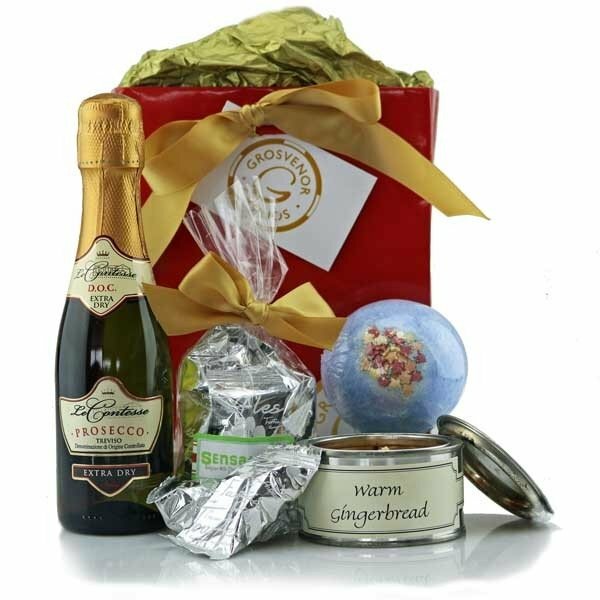 With Prosecco and a selection of exquisite chocolates presented in a beautiful wicker basket this one is bound to be remembered! Superfood Selection - £17.99 ex VAT. With health and well-being at the forefront of all our minds, we've created this great collection of goodies that's perfect for when you want to give your employees a delicious treat with a healthier kick. Packed with energising products this would also be ideal for conferences, away days and team meetings. 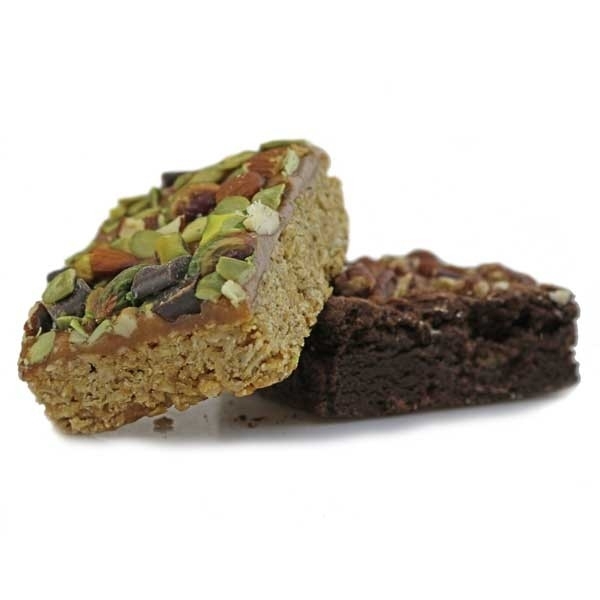 With nuts, seeds, olives, fruit, dark chocolate and energising treats, this is bound to hit the spot. Great British Tea Time - £18.99 ex VAT. Great British Tea Time will wow anyone that's fond of the good old British tradition of afternoon tea! 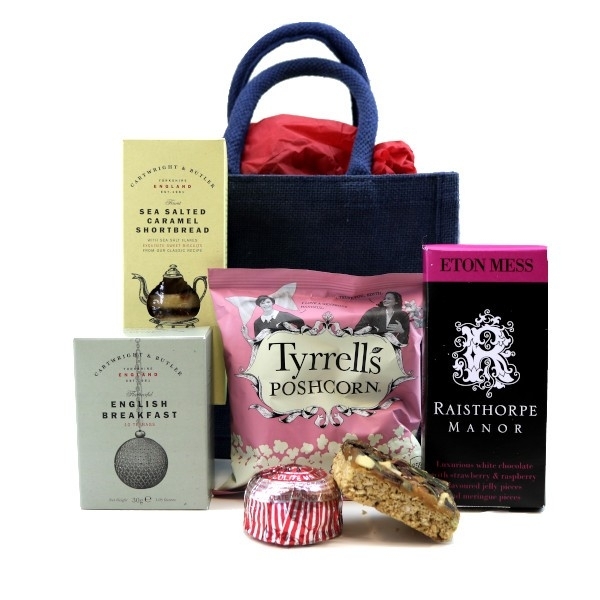 English Tradition Goody Bag - £18.99 ex VAT. Classic Collection - £19.99 ex VAT. 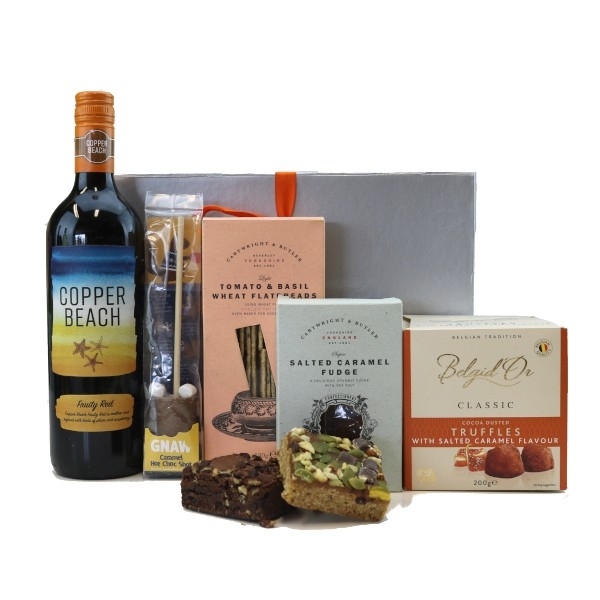 The Classic Collection hamper with wine, artisan cakes, champagne truffles and treats - a perfect selection of goodies all beautifully packaged to make sure that you give the right impression to clients or employees. Many Thanks - £19.99 ex VAT. 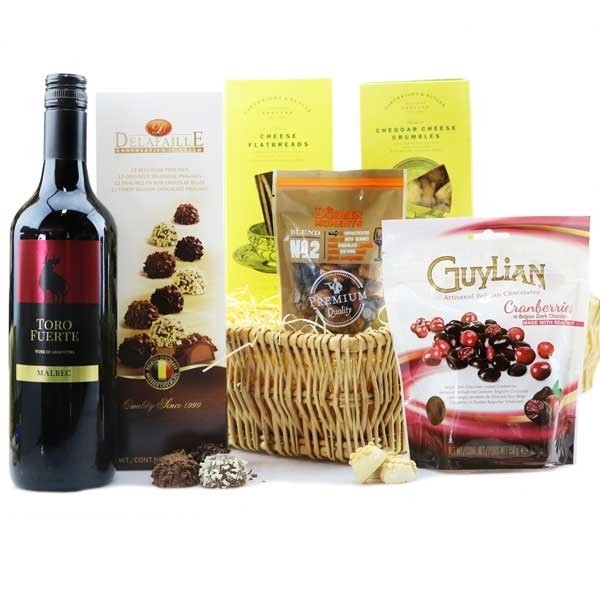 Ready to order for next day delivery, this hamper contains a premium bottle of wine and a selection of treats that will both surprise and delight. 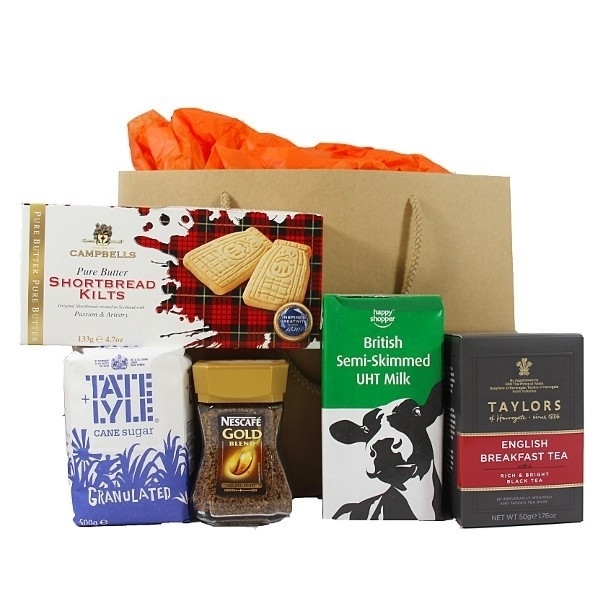 With a selection of biscuits (sweet and savoury), chocolate, sweets and a pack of premium breakfast tea this makes a perfect gift for clients and anyone that deserves more than a thank you card. Almighty Mailer - £19.99 ex VAT. Ready to order for next day delivery. The Almighty Mailer is perfect to pop in the post and send as a thank you gift to clients, employees or even to a team as a reward to share. With brownies, giant muffins, teacakes, sweeties, luxury chocolates, luxury topped iced loaf cake, giant cookie as well as something for those that need something gluten and/or diary free from our friends at Nakd, there's plenty for everyone to enjoy and share! 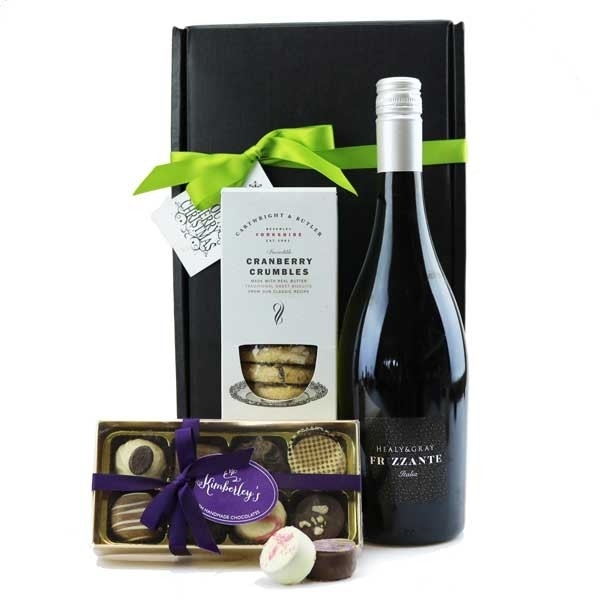 Go Nuts with Wine and Chocs! - £19.99 ex VAT. 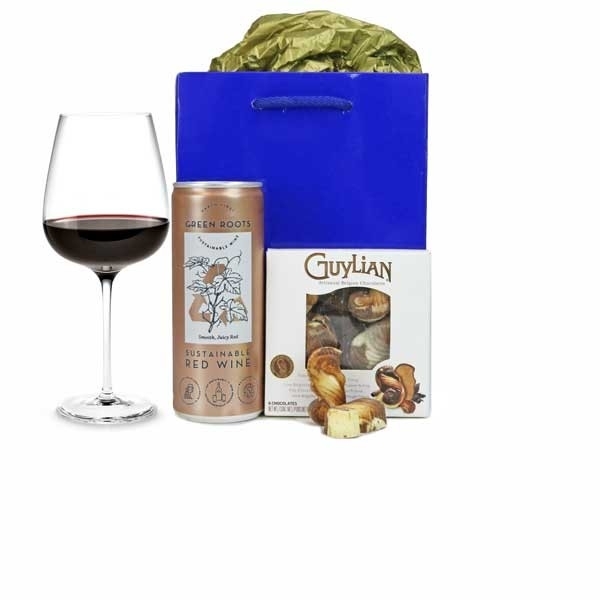 A gold gift box containing a bottle of red and white wine, premium nuts and Guylian chocolates. The perfect nutty alcohol treat! Double Delight! - £19.99 ex VAT. Not sure which wine to have? Why not choose 2! Along with a few extra treats! Christmas Choice - £19.99 ex VAT. La Maresca, the perfect Wine Choice. Presented in a superb box with a lift off lid. Irresistible Monty Bojangles Choccy Scoffy Truffles and Dormen Yoghurt and Raisin Mix accompany these great Tasting Wines. Not forgetting a Candy Cane too! Inspiration - £19.99 ex VAT. 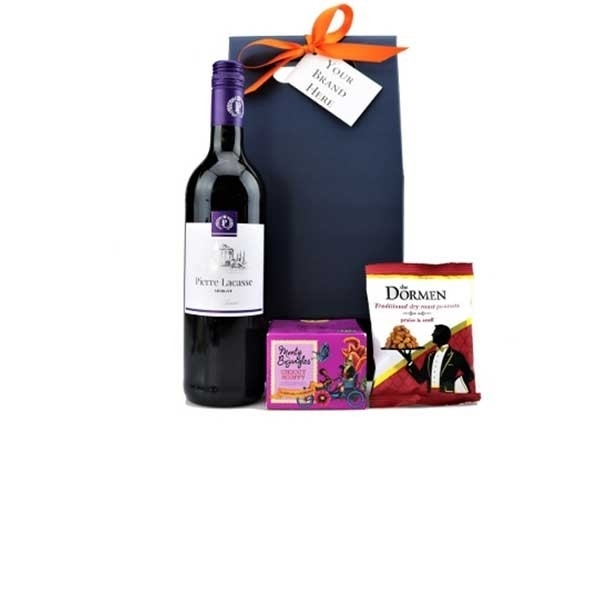 With a bottle of soft juicy Merlot from the fabulous Le Jardin range, paired with a delightful box of Belgian chocolates this classic gift is bound to impress. Henri Rousseau's series of jungle prints were the inspiration behind the label for this quirky bottle - which we love, not only for the artwork itself, but also the amazing texture of the label itself making it a real talking point! Wine & Dine - £19.99 ex VAT. 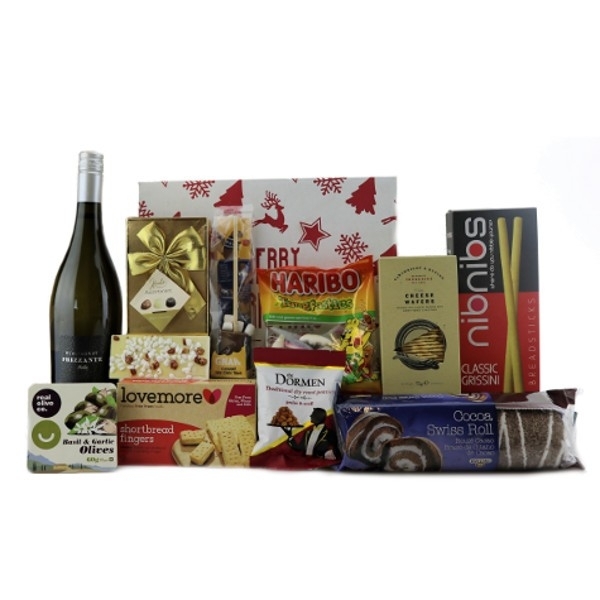 A fabulous hamper for under £20, with a little bit of everything and a big bottle of wine! Choose from red or white, or upgrade to a Prosecco and customise your hamper to suit! Gift Tray of Beers - £21.99 ex VAT. A perfect choice for those that like good quality beers with some great nibbles to accompany them. With the moreish rich and malty bottle of Bombardier from the Charles Wells Brewery and the outstanding London Pride premium ale from Fuller's this basket is indeed a winner. Matched with some amazing savoury treats, you're bound to impress. Choice Collection - £21.99 ex VAT. 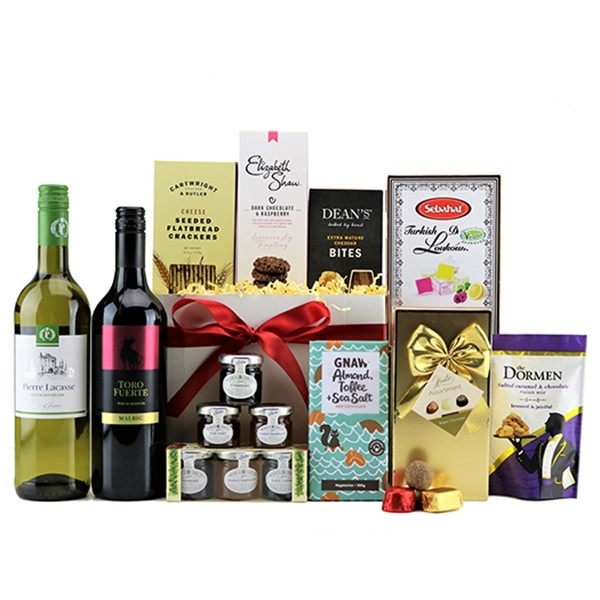 With a bottle of Shiraz and some delicious handpicked contents including the wonderful Artisan Cake Squares, this is indeed a Choice Collection. 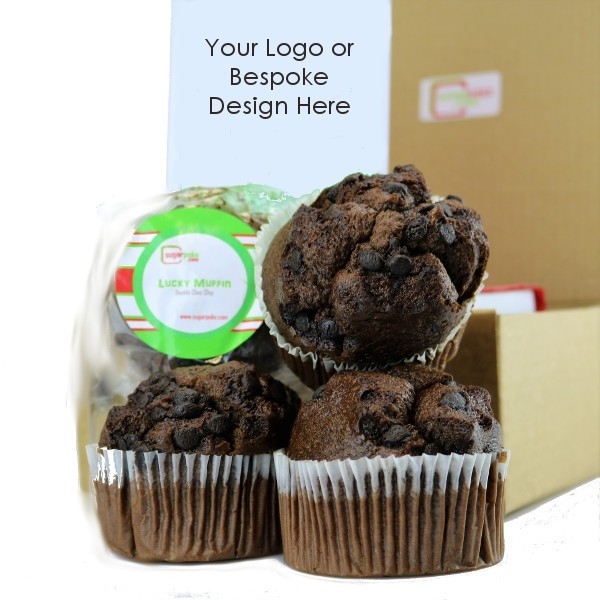 Personalised Muffin Monster Mailer - £21.99 ex VAT. Perfect to send to clients or a team of employees. Beautifully packaged in a fluted postal gift box with a greetings card. This tray of delicious muffins contains 12 muffins, each with a label that can be printed with your company logo or design. The greetings card can be from a choice of our unique stock designs that you can personalise with your company logo and message, or you can have your own design. Place an order online and we will contact you for your personalisation details. If you want to send the Muffin Monster to several recipients, we can either send them to you in bulk, or send them out direct for you. We have an address template that we will send you for completion and then we'll do the rest! You have the option to send by Royal Mail (1st or 2nd Class) or by courier. Sparkle Selection - £21.99 ex VAT. 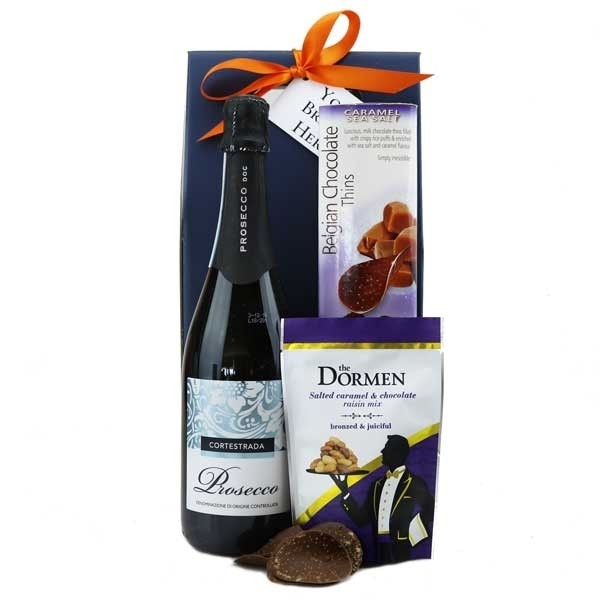 A classic combination of luxury handmade chocolates, exquisite biscuits and a bottle of superb sparkling Italian wine. Perfect for any occasion! 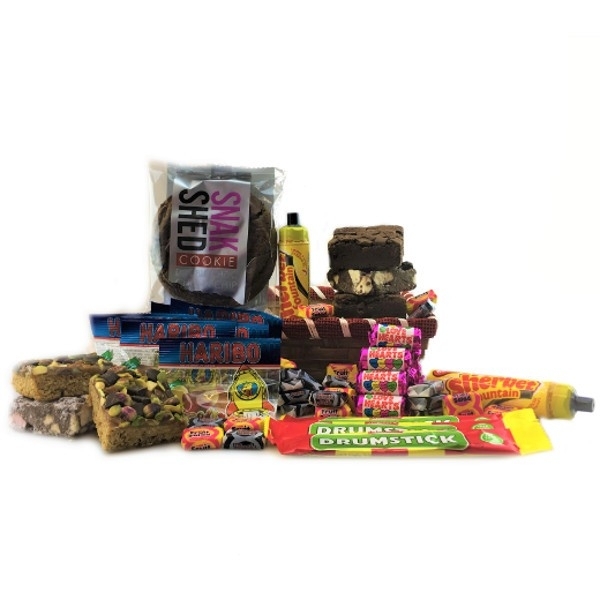 Vegan Heaven Hamper Box - £21.99 ex VAT. This Hamper box is perfect for any happy vegan! Packed with plenty of goodies including flavoursome treats from our friends at Lazy Day foods, and a handmade refresher soap slice made with pure all natural essential oils! Simpatico - £21.99 ex VAT. 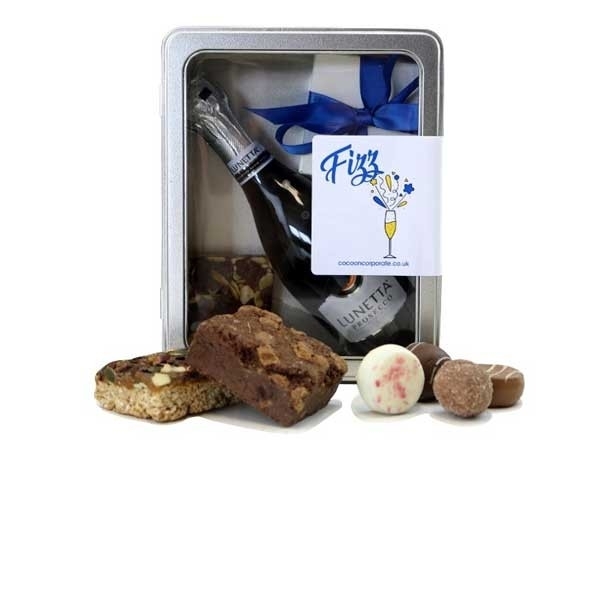 Stylish and simple, this gorgeous selection of bubbles, creamy premium fudge and Dormen's fantastic fruit and nut blend. Available in pink (Spumante Rosa) or Gold (Simpatico Prosecco Oro) for a real treat! Best of British - £22.99 ex VAT. 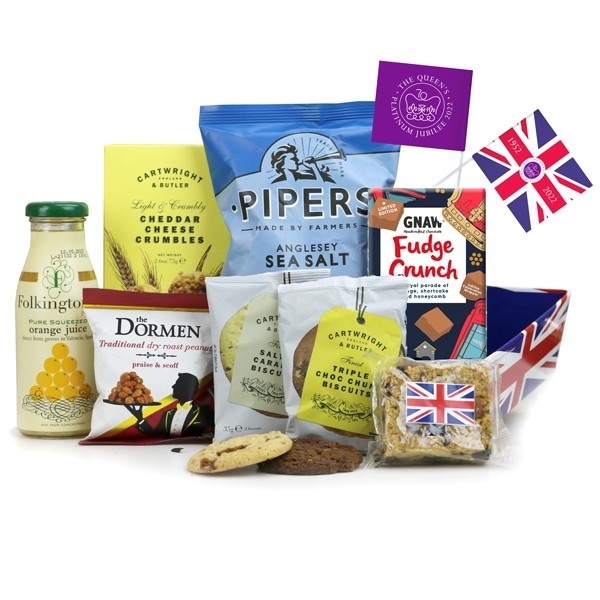 Fly the flag with this fabulous Great British selection - whether its an event entertaining visitors from abroad or as a treat for British employees, this hamper will hit the mark! Clarity - £22.99 ex VAT. 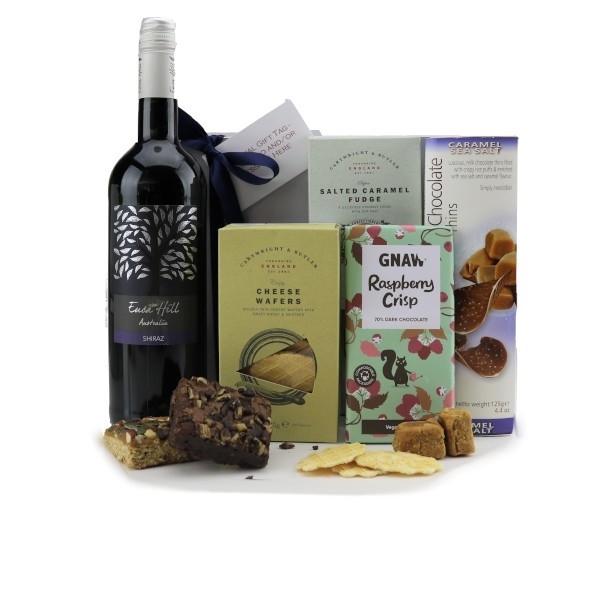 A stunning bottle of Claret with some classic accompaniments that make a fabulous all year round hamper. Great British Eton Mess - £23.99 ex VAT. 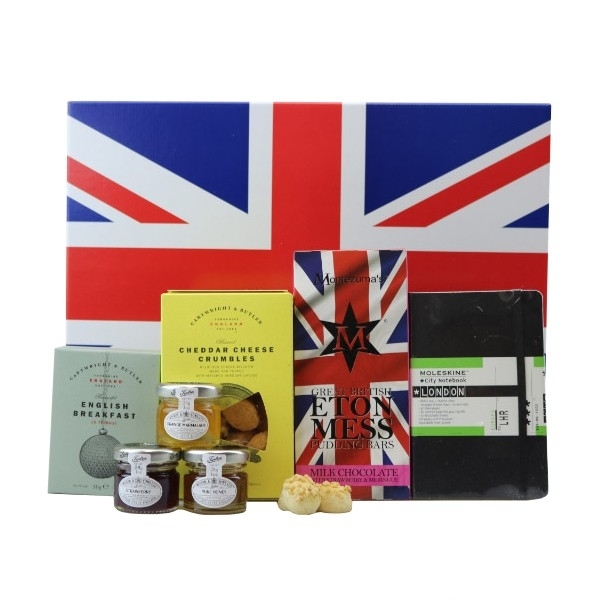 A Union Jack Gift Box containing fabulous British Themed products consisting of a London City Notebook, Great British Eton Mess Pudding Bars, 3 Tiptree jams in Honey, Strawberry and Orange Marmalade. A box of Premium Quality English Tea Bags (10) and Cheddar Cheese Crumbles. Bottle of Champagne - £24.99 ex VAT. 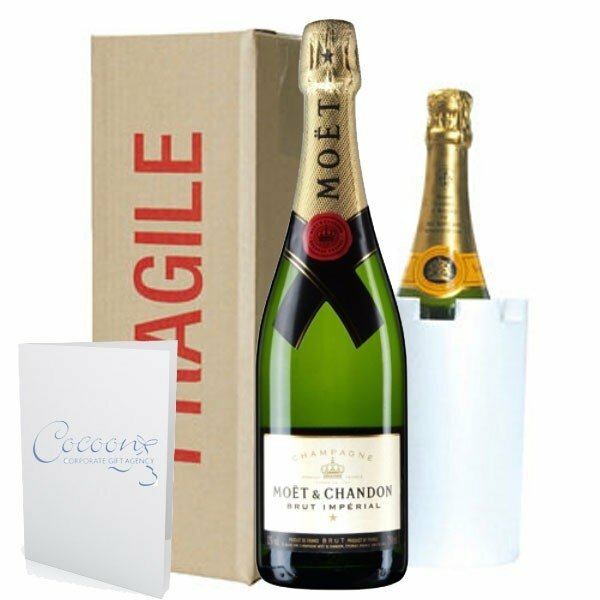 A bottle of House Champagne 750ml or choose from our wider selection of Champagne brands in a specially designed champagne bottle mailer with a personalised greetings card. 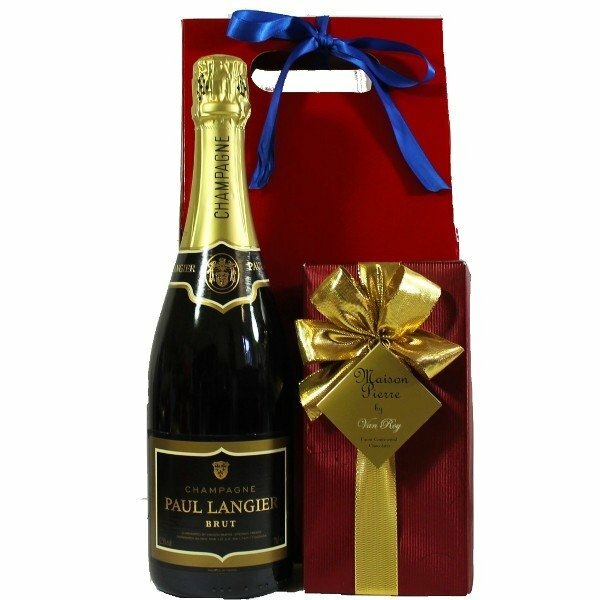 This champagne is ideal to be send direct to your recipient and includes a greetings card which can be personalised with your artwork & design and/or logo as well as your message. 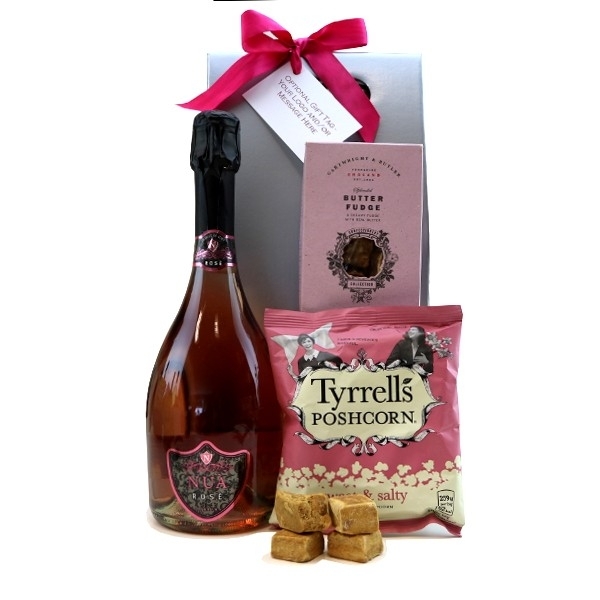 Great to maximise brand exposure when sending gifts direct. We can send direct to lots of different addresses if required, we just require you to complete an address template and we'll do the rest! Ideal for sending congratulations on a new job, to say happy birthday, merry Christmas or even welcome to your new home! If you have a specific champagne that you would like to send, please just ask. We can usually source it even if it's not listed! Vegan Delight - £24.99 ex VAT. A delightful gift box full of carefully selected produce that's just perfect for vegetarians and vegans. 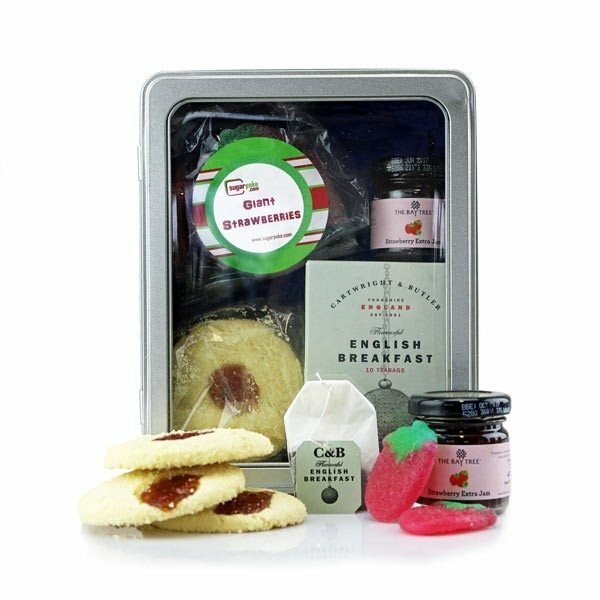 Including items from the outstanding Lazy Day Foods who produce amazing biscuits and shortbread that are not only free from everything, but are full of taste, they will not be disappointed. Less is More - £25.99 ex VAT. Less is more with this luxurious gift hamper. 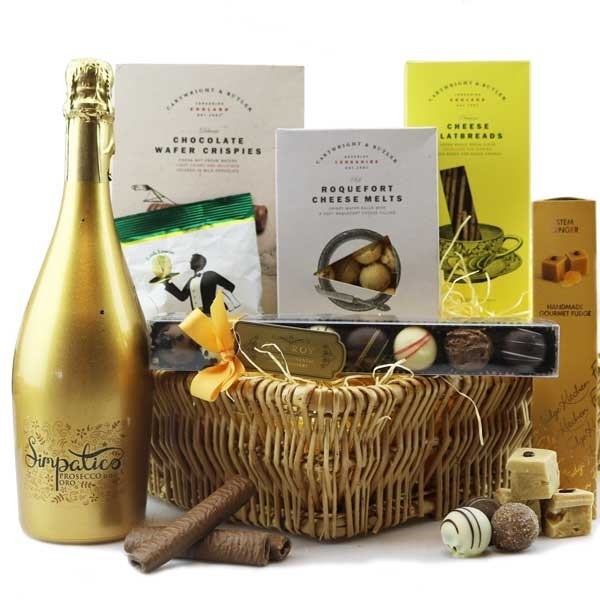 The elegant Simpatico Prosecco D.O.C Oro in the beautiful gold wrap is a perfect match with the finely gift wrapped collection of unique Belgian chocolates. Double Indulgence - £26.99 ex VAT. These premium wines go perfectly with the mouth watering selection of chocolate delights. A real treat for anyone! 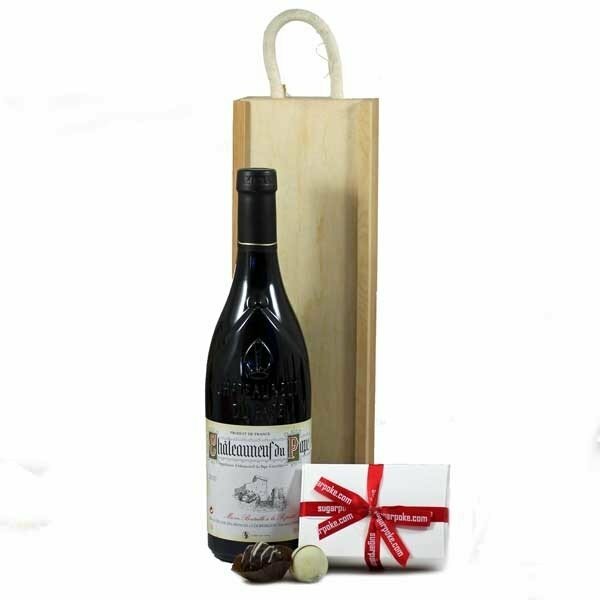 Chateauneuf & Chocolates - £29.99 ex VAT. 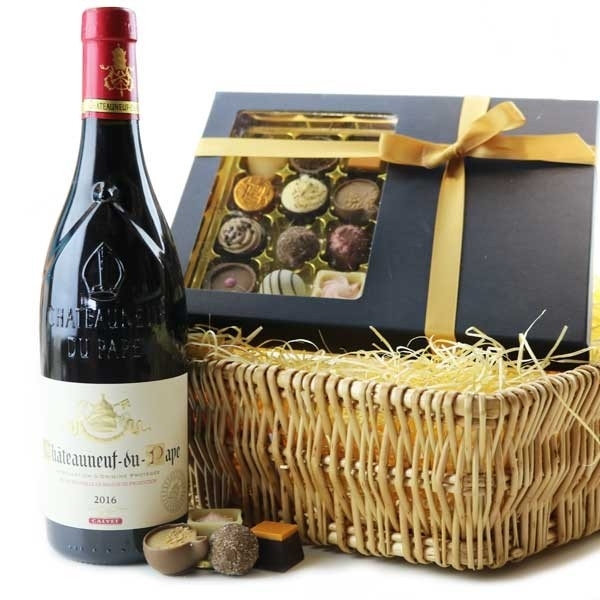 A premium option, the Chateauneuf & Chocolates are beautifully presented in a gorgeous Wooden Box Bottle Hamper. Luxury Sparkle - £29.99 ex VAT. 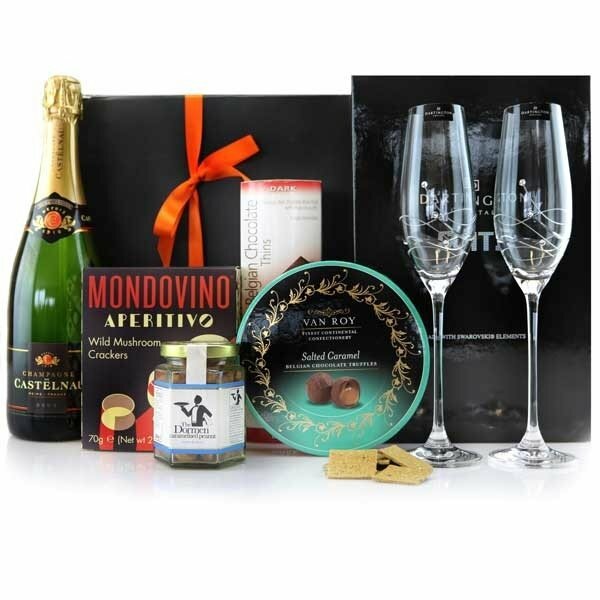 Ready to order for next day delivery, this gorgeous premium wicker tray contains Italian sparkling wine along with a whole host of premium treats that the recipient will love! Finished in a cello wrap this large basket will create a huge impact on delivery! Retro Sweetie Hamper - £29.99 ex VAT. There's nothing better than surprising your team with a big box of goodies for a job well-done! This box will do exactly that.... filled to the top with a mix of fabulous retro sweeties there's something for everyone. 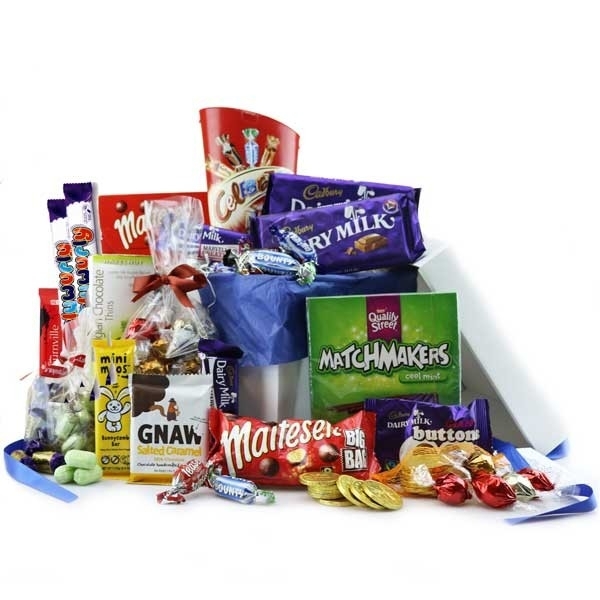 We can make up these big sharing boxes to order - whether you have big or small teams that you want to surprise, we can scale up or down the amount of goodies in a hamper box and tailor it to your requirements. We can add chocolates, drinks, party goodies or just more sweeties - just ask us, and we'll create something just for you. Champagne Classic - £29.99 ex VAT. 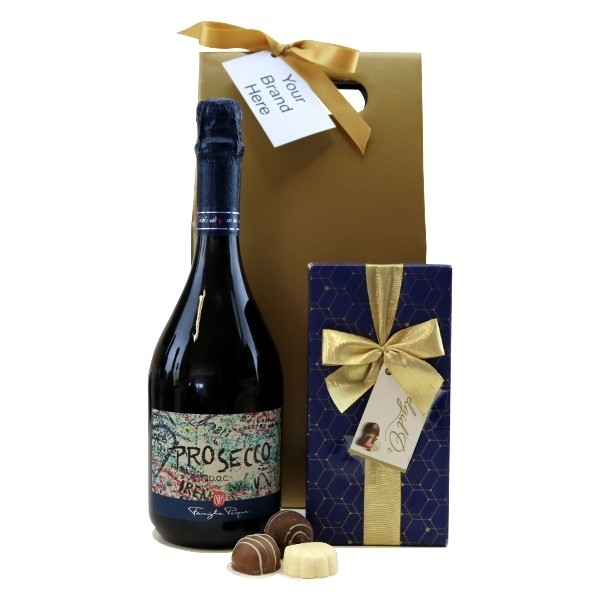 You can never go wrong with a good bottle of Champagne and Belgian chocolates, so we've created this stunning gift for whenever you need to say Thanks, Happy Birthday, Merry Christmas or even congratulations on a job well done! We've paired this stunning box of chocolates with our house Champagne, but if you want to upgrade it to a brand like Moet, please just ask, we have a wide selection available. Boxed Banquet - £29.99 ex VAT. 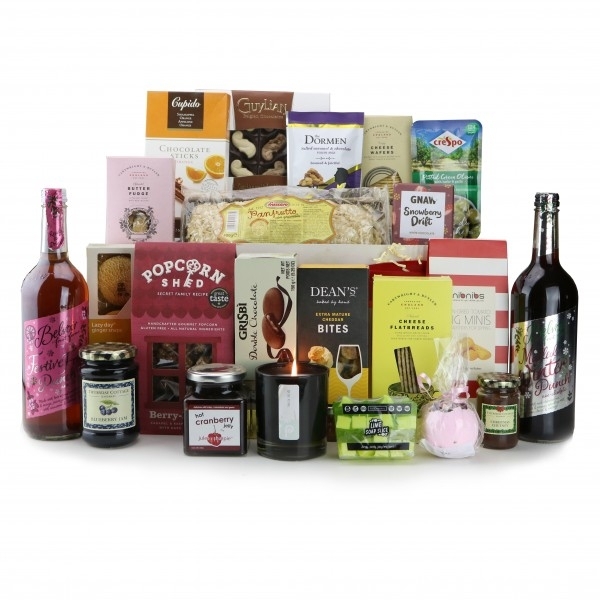 A finely boxed banquet packed with plenty, this fetching hamper box would be greatly received by anyone! 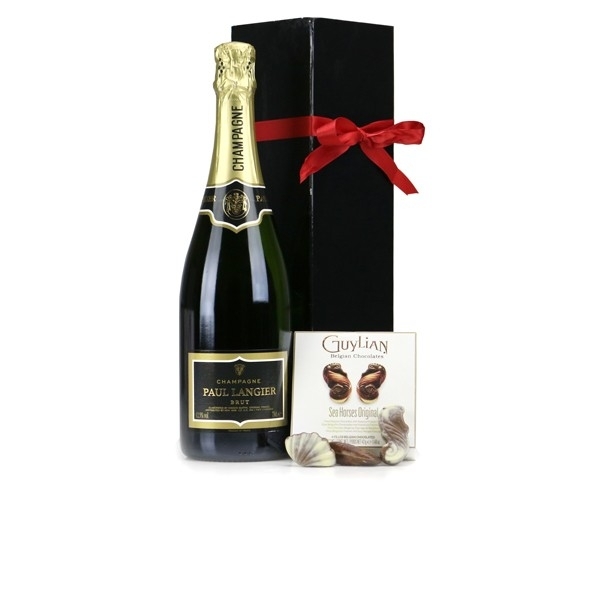 Champagne & Luxury Chocolates - £31.99 ex VAT. 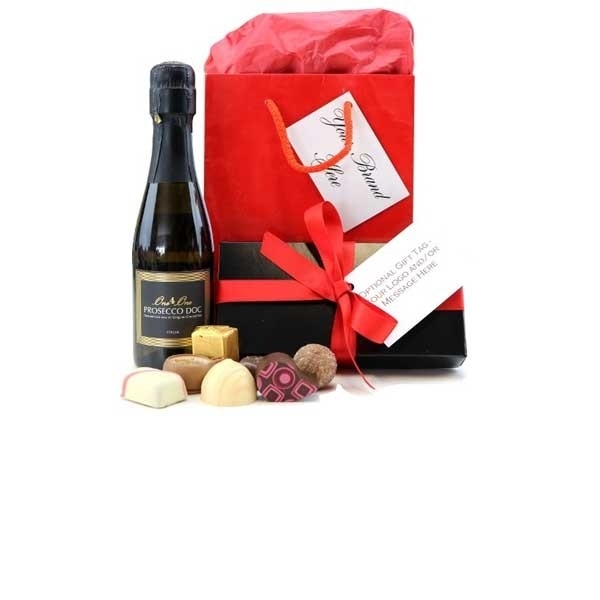 A classic corporate gift - Champagne & Luxury Chocolates. Bound to please and bound to impress with a refreshing champagne and a ballotin of delicious Belgian chocolates. Wine Basket - £31.99 ex VAT. Choose from a bottle of premium red or white wine to complete this lovely selection of goodies all packed up in a quality wicker basket tray. Including a stunning box of Finest Belgian Chocolate Praline, this basket of delights is bound to impress. Three Little Pigs Hamper - £32.99 ex VAT. 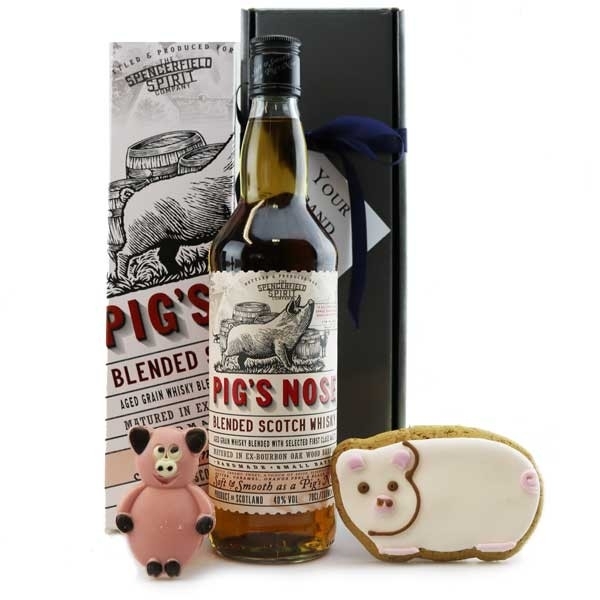 A quirky and delightful hamper that includes a bottle of the exceptional Pig's Nose, an aged grain whisky blended with selected first class malts. The smoothness of the whisky is rooted in using only the finest malt whiskies and marrying these with gentle aged grain whiskies... all to produce a Scotch whisky that's as 'soft as a pigs nose'. It's gentle, creamy, sweet with a touch of spice, butter, caramel, orange peel and black pepper. Luxury Basket - £32.99 ex VAT. 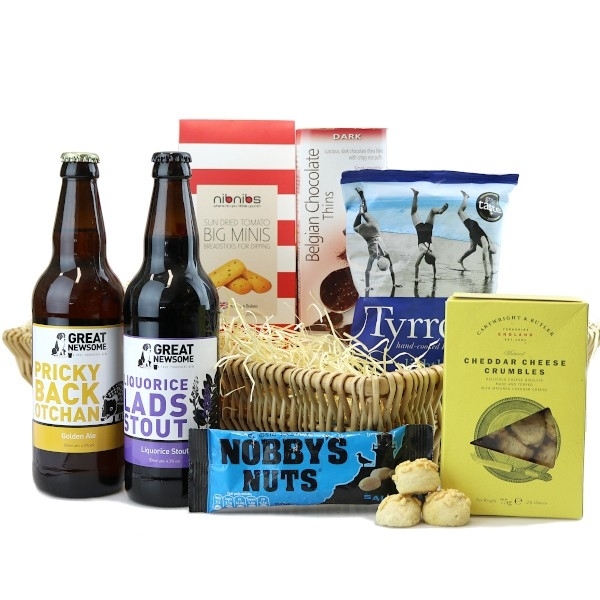 The Luxury Basket is a real treat for those that appreciate great food and drink. 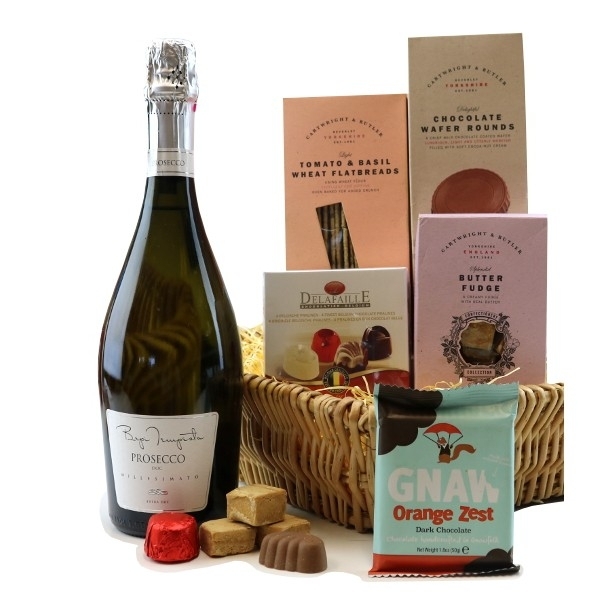 With a bottle of bubbles, chocolates, luxury fudge, chocolate wafers and savoury snacks that add a real punch, it's a great hamper that will suit everyone whatever time of year. 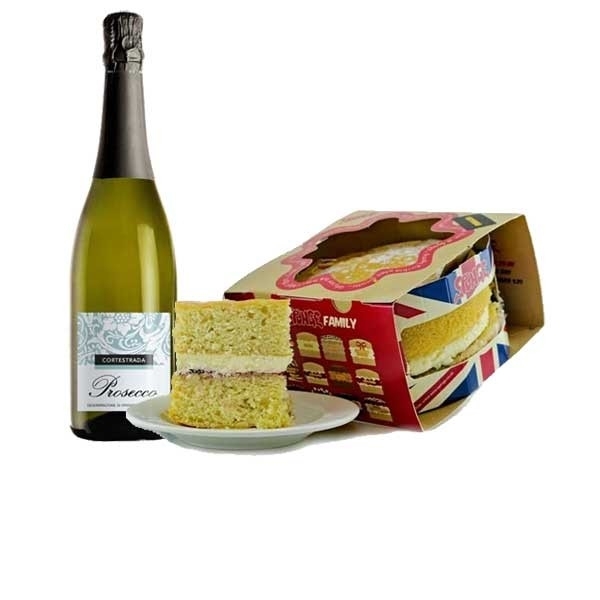 Celebration Cake & Wine - £34.99 ex VAT. 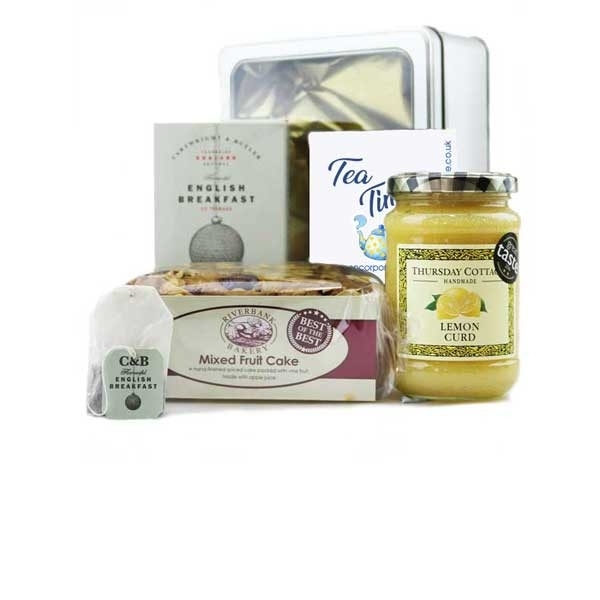 This superb celebration gift includes a large, deep, 7 inch Victoria Sponge Cake and a bottle of Sparkling Italian Wine packed securely in a mailing carton for safe delivery. Made with the best quality ingredients, the fabulous cake is freshly handmade in small batches to ensure that you absolutely love every mouthful. We've chosen to feature a classic Victoria Sponge with a vanilla flavoured sponge, raspberry jam and vanilla butter icing, but there are 14 other delicious flavours to choose from.including Carrot, Caramel & Peanut, Rocky Road, Sticky Toffee and Millionaires, so please just ask for details if you'd like to change your flavour! Mighty Coffee Basket - £39.99 ex VAT. Perfect for a real coffee lover, this basket of treats includes a pack of award winning ground coffee from the brilliant Grumpy Mule. Roasted with pride in Yorkshire, this coffee is a real crowd-pleaser. Carried from the Gayo Highlands in Sumatra, it's fairtrade and fabulous. With the rest of the contents carefully chosen to complete a really good coffee break, they'll find speciality coffee syrups (along with a recipe guide book), fine Italian cookies, exquisite French macarons and tasty Belgian chocolate thins. 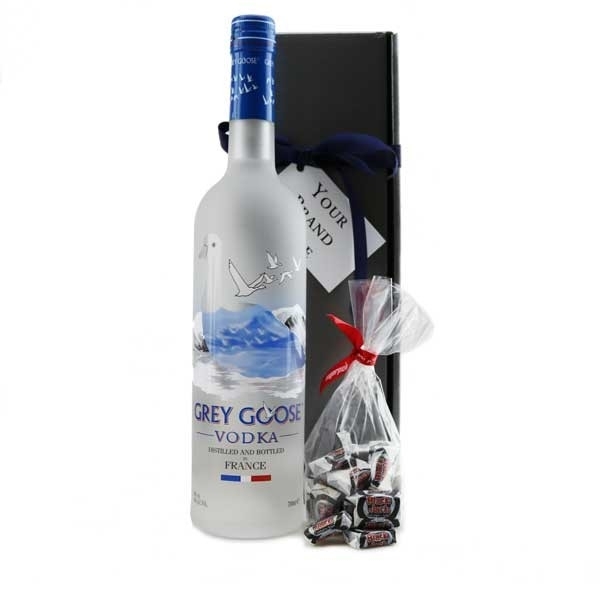 Grey Goose Hamper - £44.99 ex VAT. A vodka of brilliance, this premium spirit has become a firm favourite with vodka connoisseurs and those with discerning taste. Distilled from French wheat, Grey Goose is made with spring water from Gensac-la-Pallue that is filtered through limestone. The expertise of the Maître de Chai ensures an unparalleled smoothness and exceptional taste. With the added bag of retro sweeties, this makes this beautifully wrapped premium gift quirky and a little different from the norm. If you'd prefer to add something else to create a point of different, just let us know! 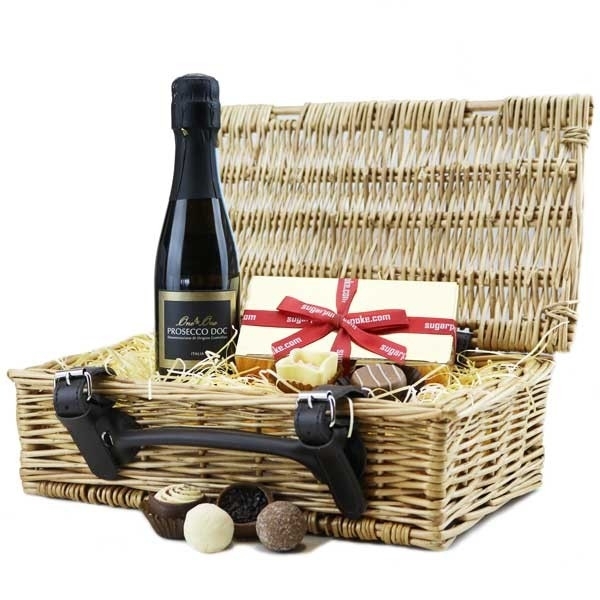 Prosecco Basket - £45.99 ex VAT. For the finer things in life, look no further. Stylish and packed with luxury items, this gorgeous wicker basket is individually woven by hand and made from top quality autumn willow. With a stunning Prosecco, finest Belgian chocolates and gourmet fudge handmade in Kent amongst the contents, they will be in for a treat indeed. Packed by hand, this basket is finished with ribbon for that luxurious touch. Champagne Basket - £45.99 ex VAT. Available for express delivery, this basket is ready to send out straightaway. 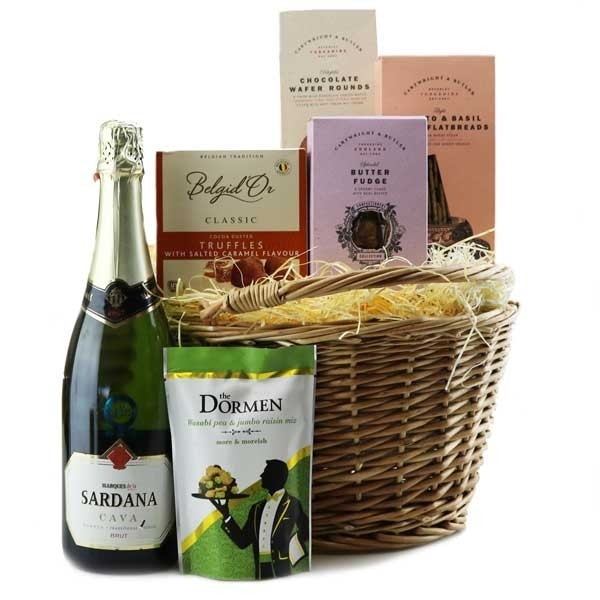 With a bottle of lively brut Champagne from Reims, this beautiful basket of quality food and drink makes a great gift. Presented in a strong willow tray that can be reused within their home, your recipients will be delighted. Rose - £46.99 ex VAT. 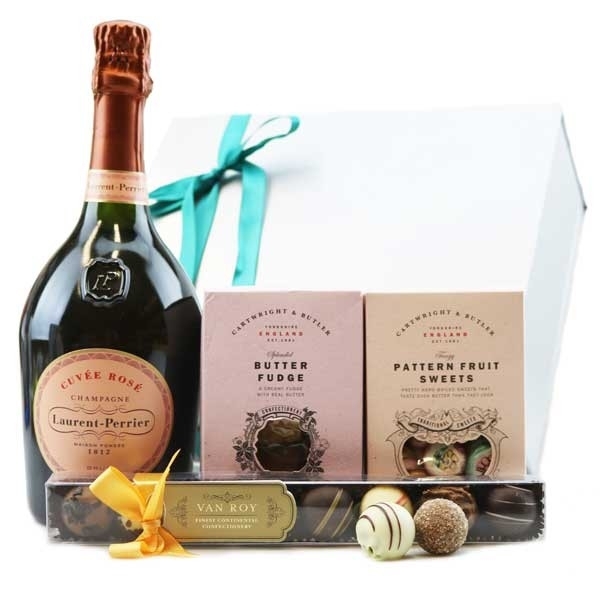 With a bottle of the beautifully delicate Laurent Perrier Rosé Champagne, this premium gift is a real crowd pleaser. One for the ladies that the men like just as much! Bliss - £49.99 ex VAT. With a stunning box of sensational handpicked chocolates and a premium bottle of Chateaueuf-du-Pape, you can't fail to impress. Presented in a beautiful wicker tray that can be kept and used about the home for that added touch of luxury. Chocolate Box Selection - £49.99 ex VAT. 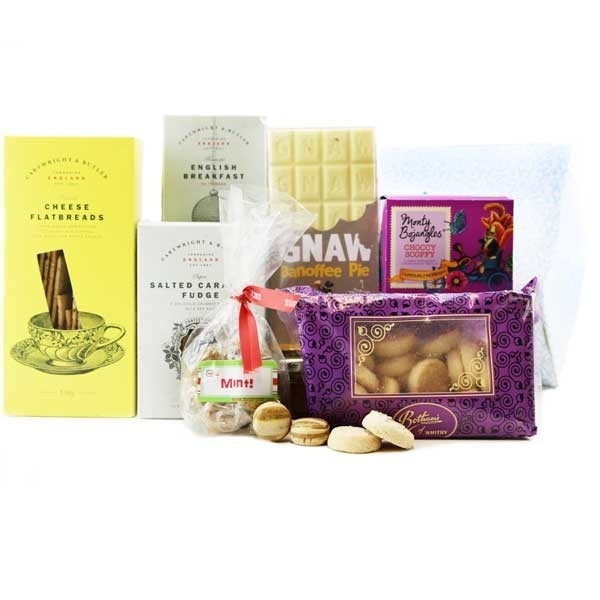 Full to the brim with a wonderful selection of chocolates for everyone to enjoy, this large hamper gift box contains a wide selection of favourite chocolate brands with bars, sharing boxes and bags. Luxo: Luxury Port & Gourmet Treats - £49.99 ex VAT. Speciality Coffee Hamper - £53.99 ex VAT. If your recipient is a coffee connoisseur, then this is a great choice for them. Including ground coffee from award winning Grumpy Mule who understand that coffee needs to be cultivated by expert growers and roasted with pride. This amazing fairtrade coffee is partnered with speciality coffee syrups and a bottle of Bell's for an Irish Coffee to give an even bigger kick to their cuppa. There's also a pair of gorgeous coffee glasses to show off their coffee creations so they can relax and savour the taste. Calm - £54.99 ex VAT. 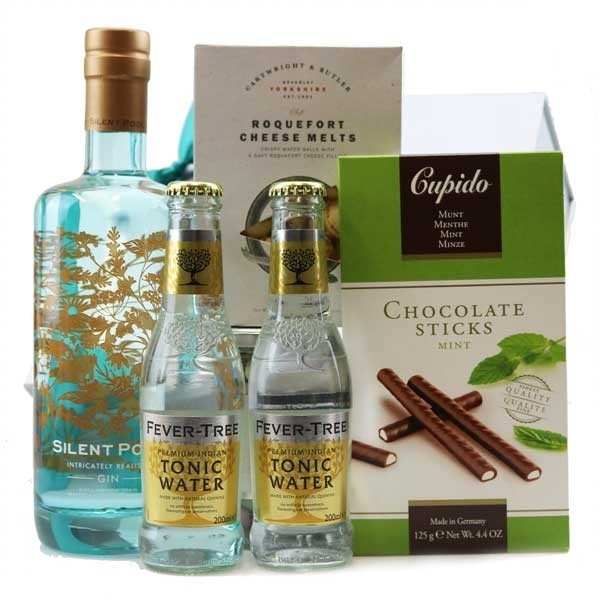 With the sensational Silent Pool Gin and premium Fever Tree mixers, this is a ready made hamper to enjoy a little me-time with. 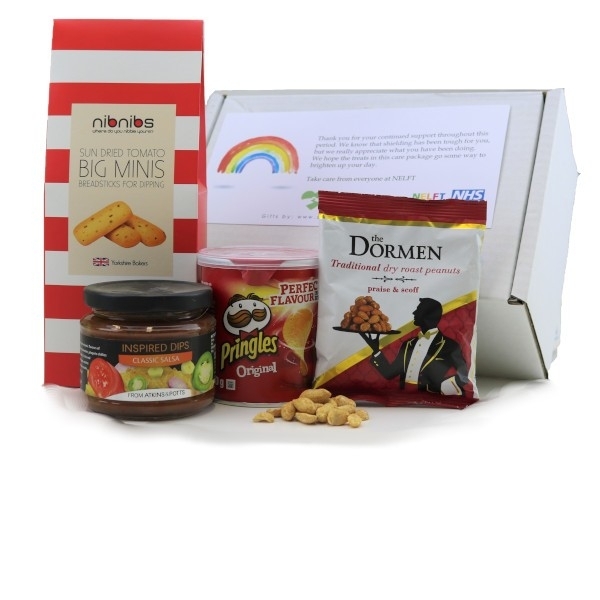 A perfect summer-time hamper, it makes a great gift at any time of year. Salute! - £55.99 ex VAT. 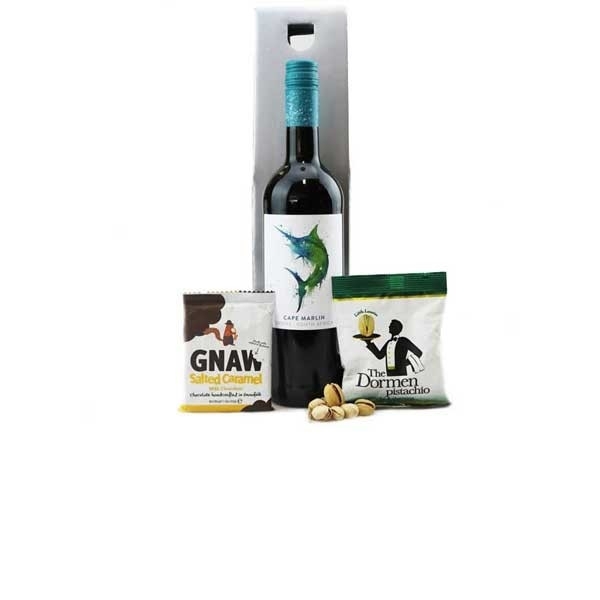 With 2 bottles of premium wine and a wide range of delicious products this is a hamper that will delight and impress. From old fashioned favourites to fabulous finest shortbread and an innovative luxury chocolate bar, this has something for everyone. Six Bottle Wine Hamper - £57.99 ex VAT. 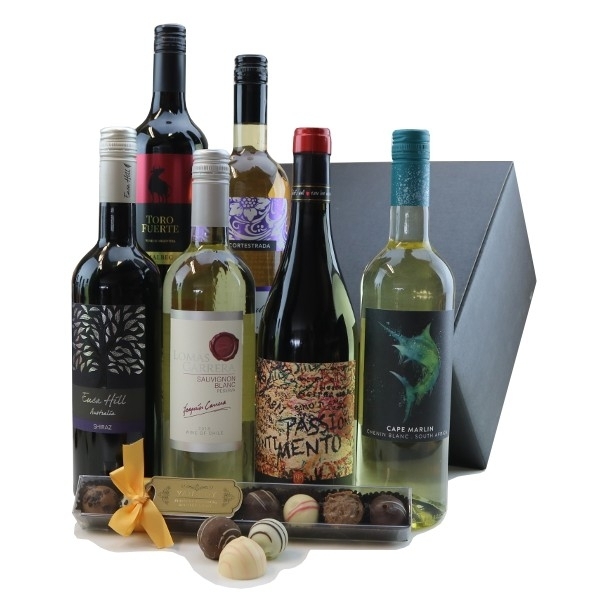 A fabulous hamper for wine lovers! 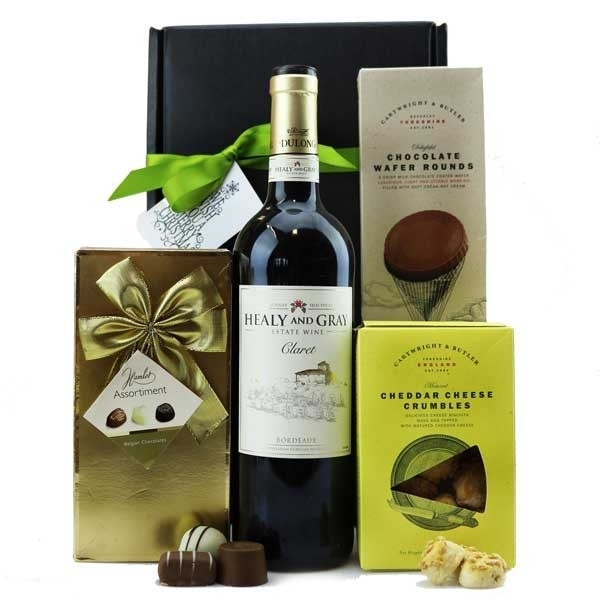 With six great wines and a box of premium, luxury chocolates, presented beautifully in a black textured Gift Box, this hamper is a great choice at any time of year. Mellow - £59.99 ex VAT. Add a touch of class with handmade crystal highball glasses. 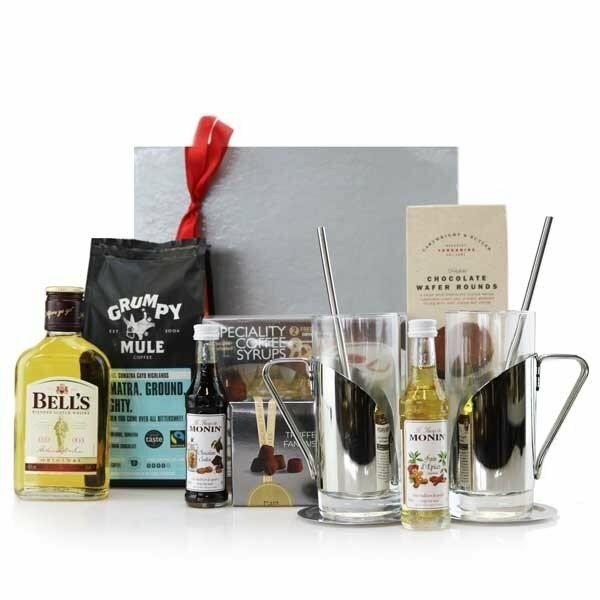 A perfect alcohol free hamper, this contains the very best selection of food and drink picked for their quality ingredients. Flair - £63.99 ex VAT. 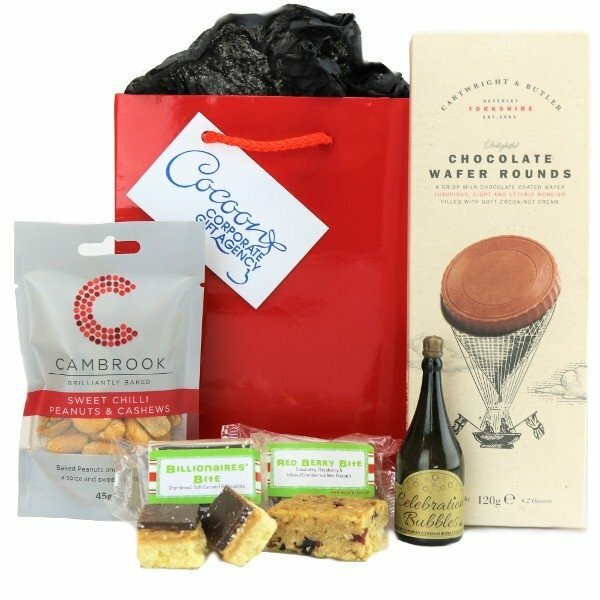 With a great selection of luxury sweet and savoury treats and a bottle of premium Prosecco, you can't go wrong with this stylish hamper. Presented in a smart magnetic closing gift box and finished with ribbon in a colour of your choice, this is an amazing choice for any time of year. Bon Vivant - £69.99 ex VAT. For all those that enjoy a luxury or two, this Gift Box is full of sensational food and (non alcoholic) drink as well as a fabulous slate Cheeseboard set and some pampering goodies from our friends at Bomb Cosmetics that are suitable for both males and females. Dressed to impress, the hamper is finished with a beautiful satin ribbon in a colour of your choice. Delizia - £71.99 ex VAT. 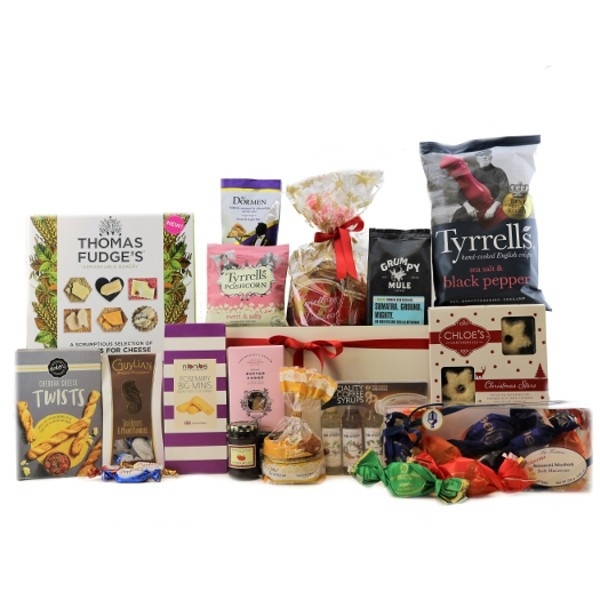 For a big gourmet hamper that's going to wow, look no further. 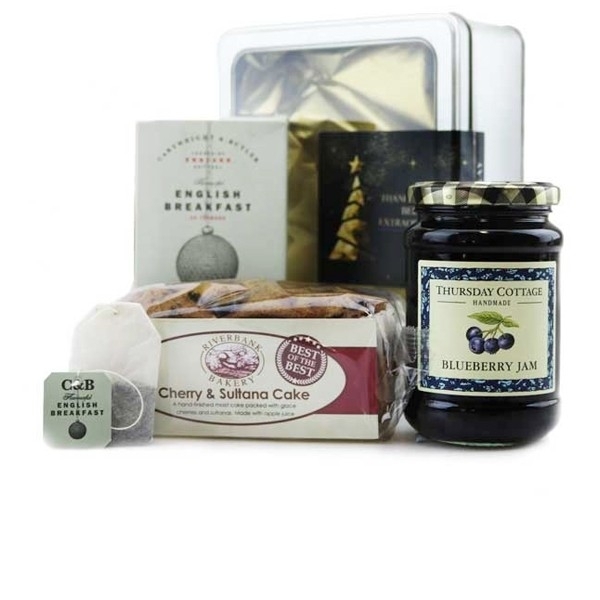 With a selection of goodies with handpicked Italian Christmas delights, including a large 750g Panettone, along with a wide selection of sweet and savoury treats, they'll love diving in to this Gift Box. Festival - £78.99 ex VAT. If there's something to celebrate, there's no better toast, than one with champagne poured into handmade crystal flutes. Finished with real crystallized Swarovski elements these glasses add glamour and sophistication to any occasion. 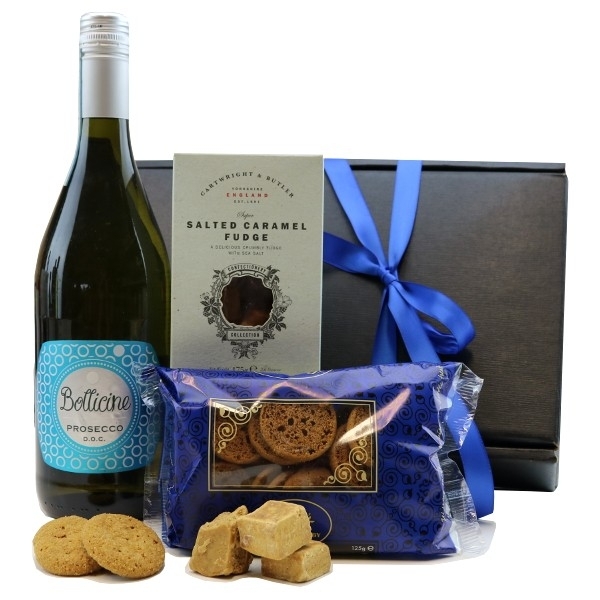 Paired with the outstanding Champagne de Castelnau that has a depth of flavour that's sought after by Champagne connoisseurs worldwide, luxury chocolates and savoury biscuits baked by hand, this will impress and delight. 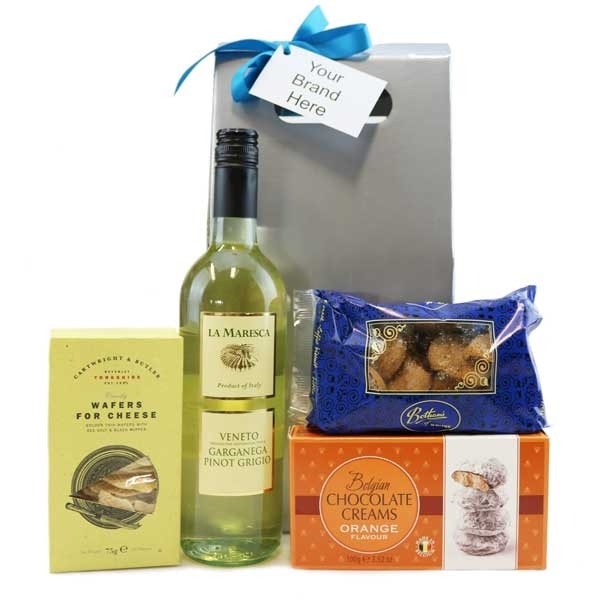 Big Team Share Hamper - £79.99 ex VAT. 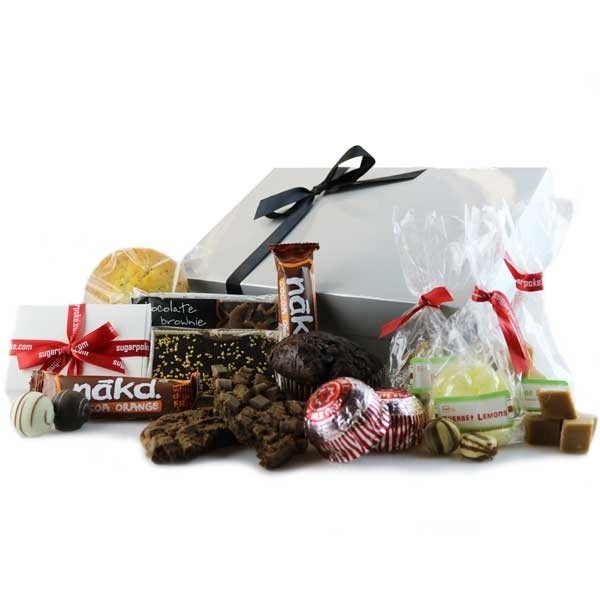 This large celebration gift box is filled with a massive selection of cakes, chocolates and sweeties - perfect to hand out for a job well done, to maintain team morale, as a pick me up or to just to say thanks. 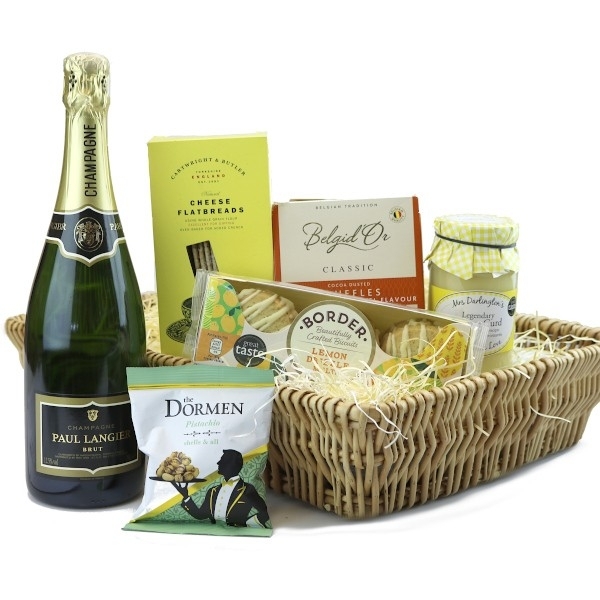 We create these hampers to order, so if you have a particular number of people to cater for, just let us know and we'll create a team celebration hamper just for you. If you have a particular brand colour, we can also pick out sweeties and chocolates to suit as well as being able to personalise the cakes and sweetie bags - just drop us a line, or give us a call. A Gourmet's Delight - £94.99 ex VAT. 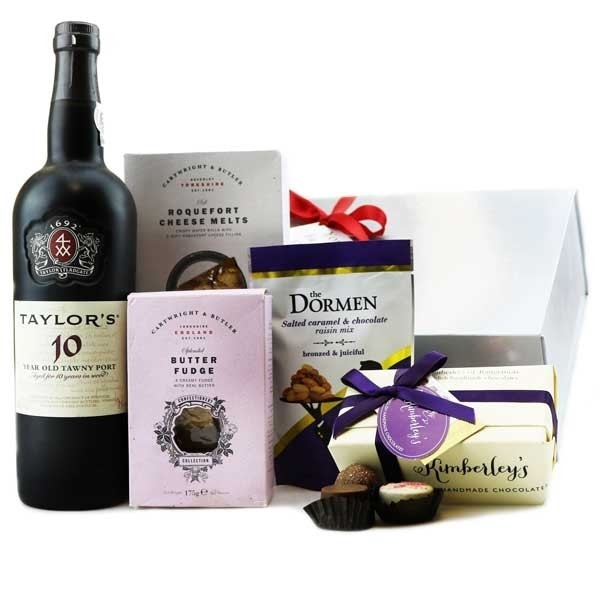 With a premium selection of drinks including a 10 Year Old Tawny Port, Baileys and a great bottle of Wine, they'll be spoilt for choice with this fabulous hamper! Full of sweet and savoury delights, there's something for everyone! Elegance - £99.99 ex VAT. 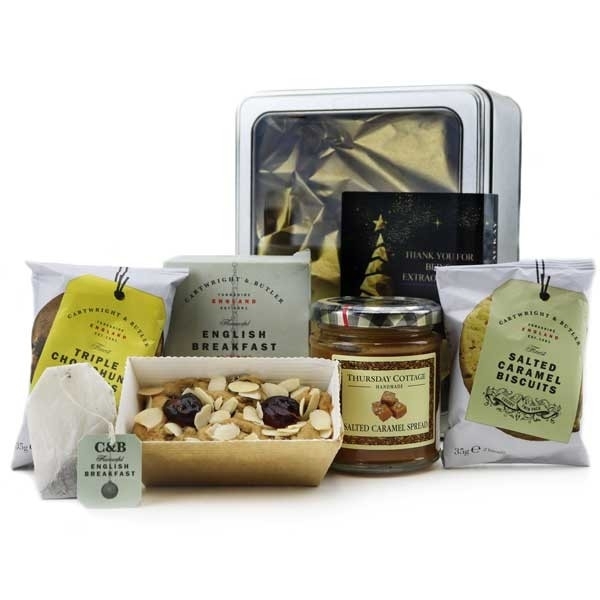 Handpicked gourmet products to make up a truly elegant hamper. 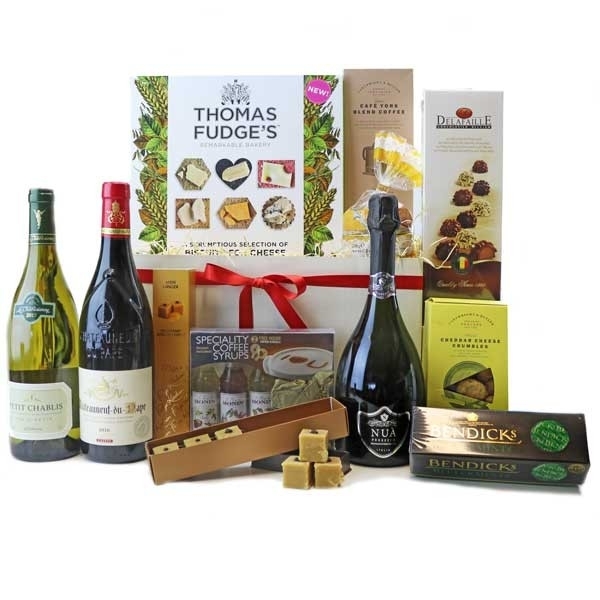 Full of all the right ingredients to make this a gift that will wow the recipients, it includes Chablis, a premium Prosecco and a bottle of Chateauneuf de Pape in amongst the delicious selection of goodies that will have mouths watering in no time. All packed in a large hamper box that can be finished with ribbon in a colour of your choice.